Vintage Dunhill tobacco made in… Germany!? A while ago I was surfing on the German ebay, looking for some goodies. 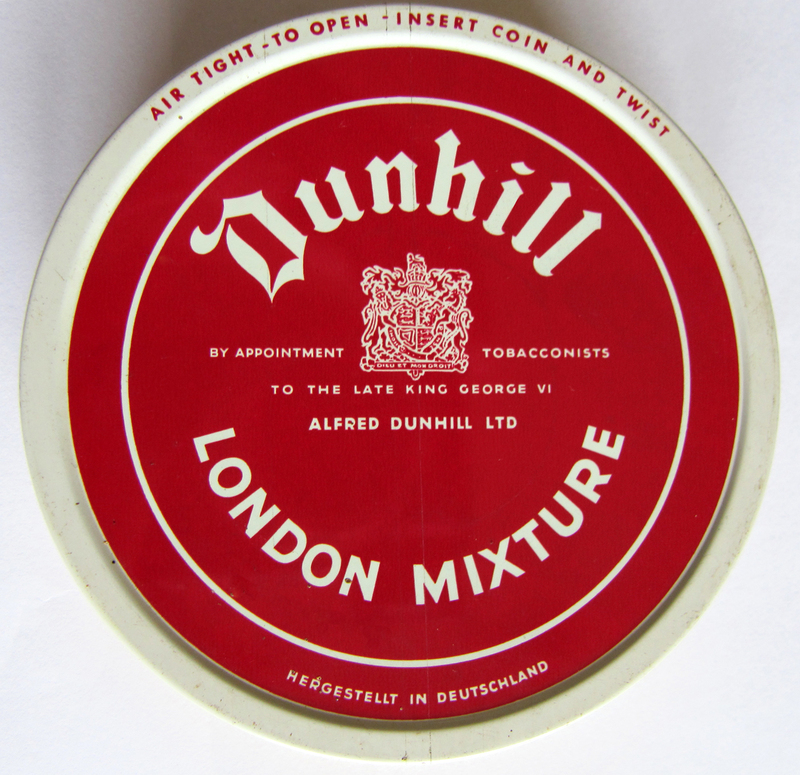 There I stumbled upon a couple of vintage Dunhill tobacco tins, one Standard Mixture Medium and one London Mixture. Unfortunately the description said that both tins were opened yet full. 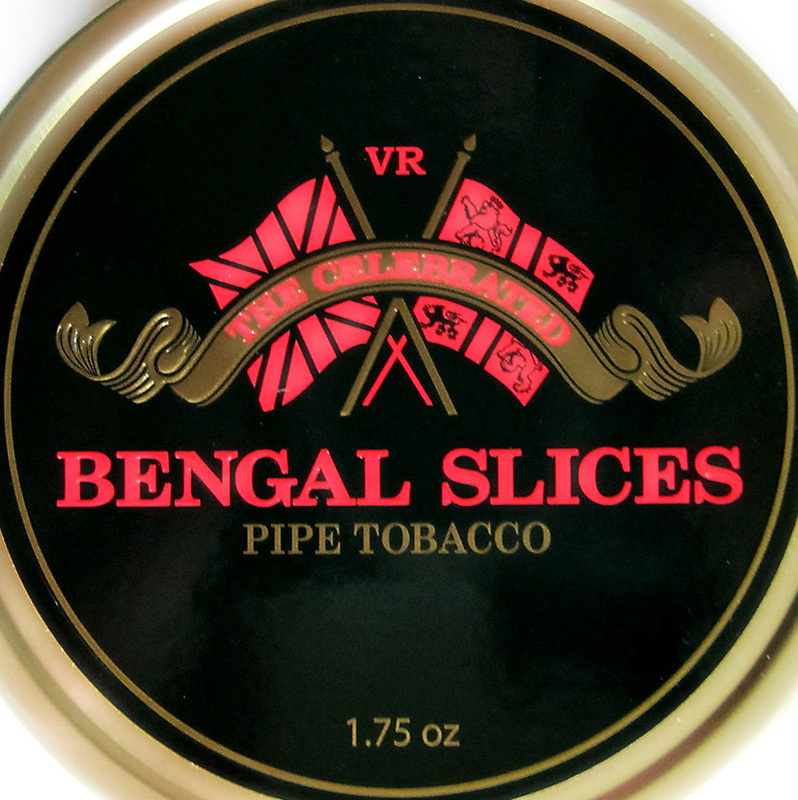 I figured that I could probably re-hydrate the tobaccos and since the price was right I decided to take the risk and bought both tins. When I received and opened the package I saw to my utter delight that the London Mixture tin was still sealed. Yesss! 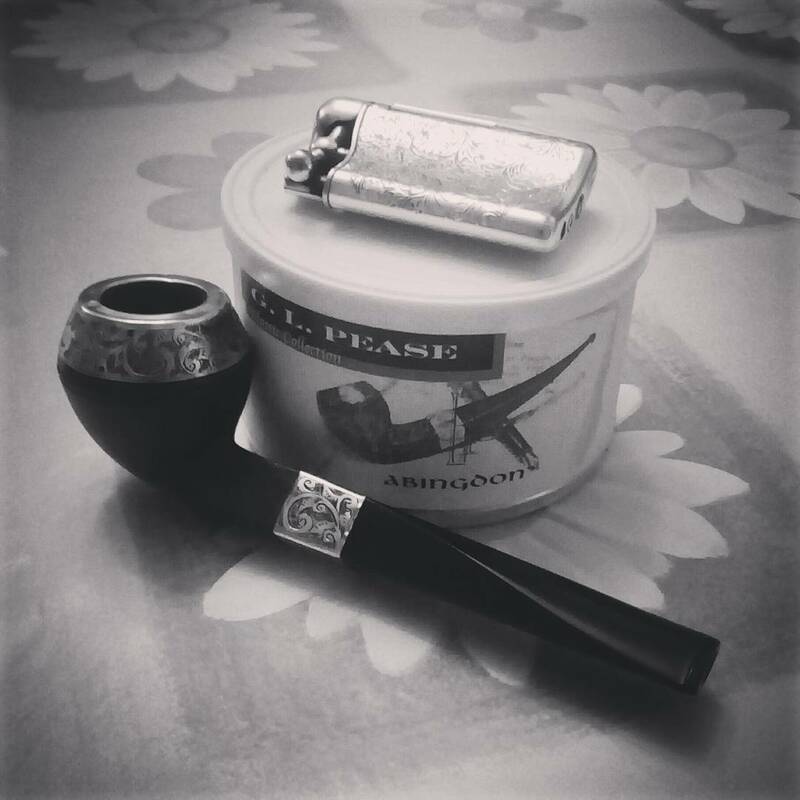 Without much thinking I happily put both acquisitions in my tobacco-closet. 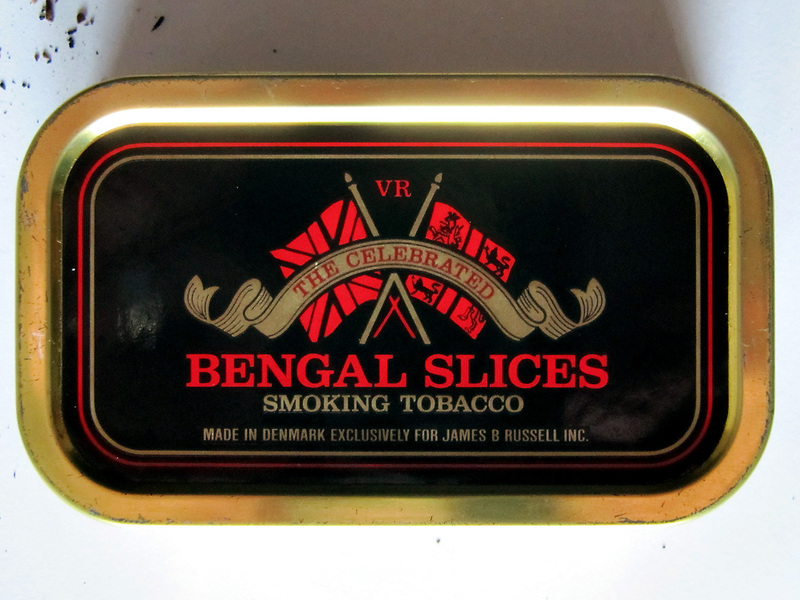 Some months ago I was going through my vintage tobacco stash, looking for something I can’t remember, when I saw the old London Mixture tin again. 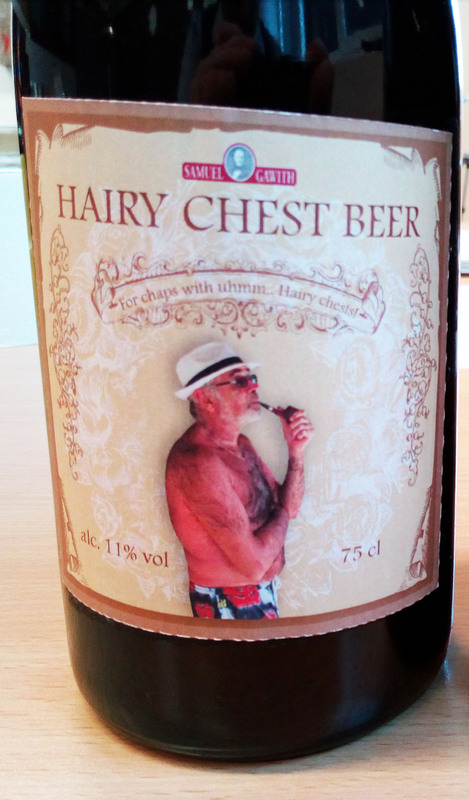 I took a better look at it and suddenly my eye fell upon a sentence at the downside: Hergestellt In Deutschland. What!? Made in Germany!!?? 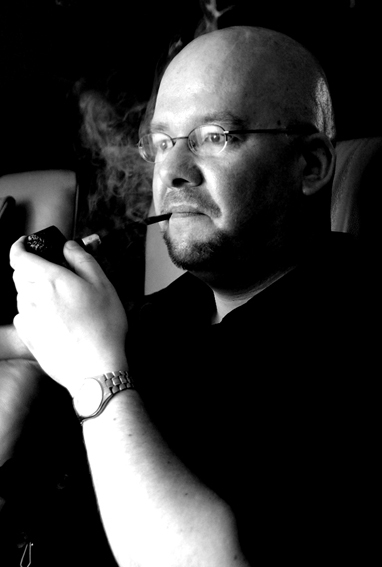 I always believed vintage Dunhill tobaccos were made in the UK, first by Dunhill themselves and later in 1981 by Murray (and from 2005 until now by Orlik in Denmark). As you can imagine my curiosity was awakened. 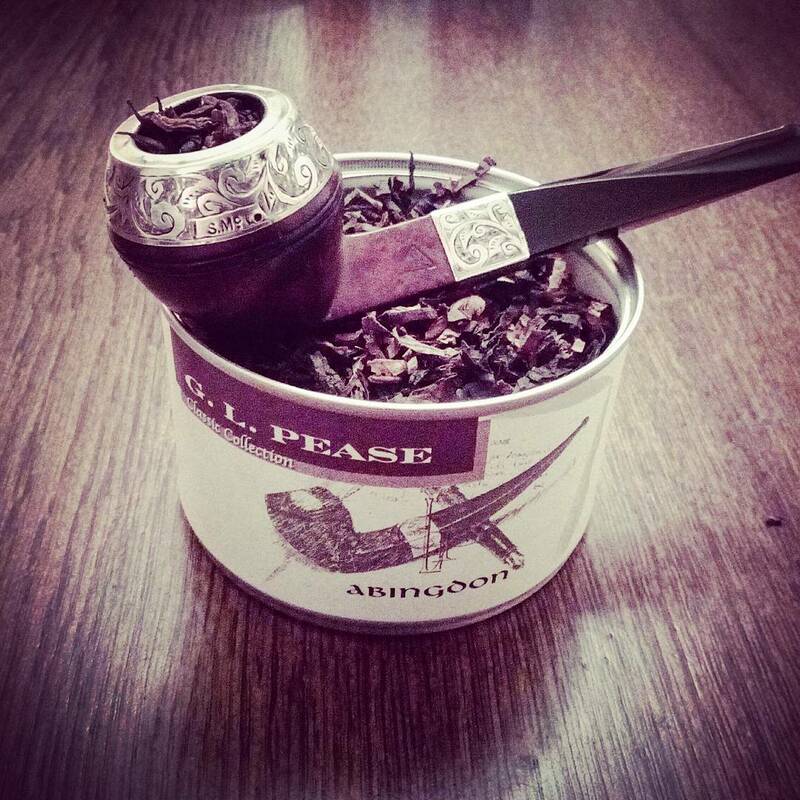 So I started asking around on international pipe fora. On the PipesMagazine.com forum I did not get much further despite friendly reactions. Kind of logical because that is more American-orientated. 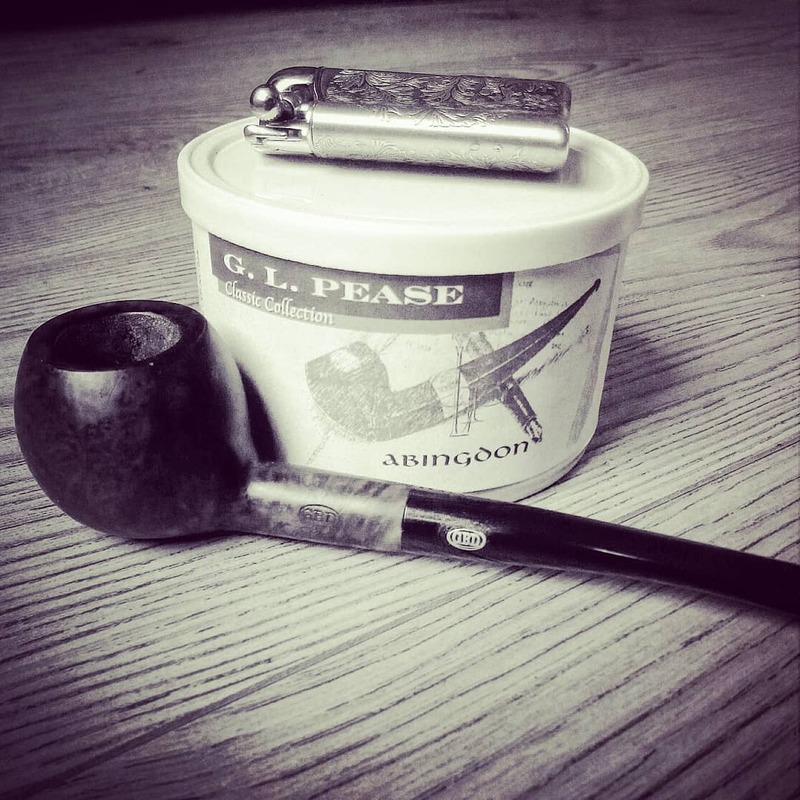 Then fellow Dutch pipe smoker Huub came to the rescue: “Arno, I am a member of a German forum, Freunde Der Tabakpfeife, I shall try to gather some information there.” And lo and behold, in no time Huub could tell me several people reacted to my question of the origins of the London Mixture tin. 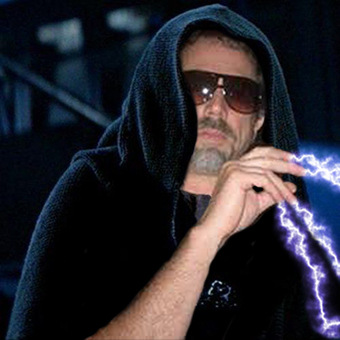 I also became a forum-member there and looked into the thread Huub had started for me. 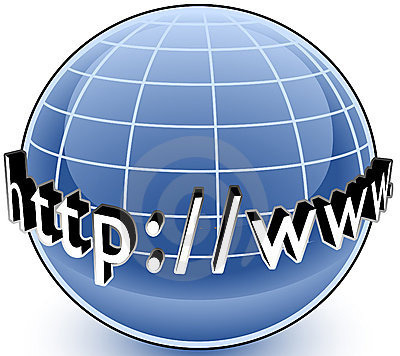 There I found a lot of information and several leads. 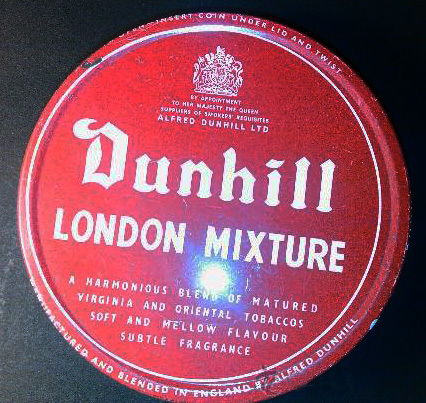 It turned out that my tin was made under license of Dunhill by German tobacco company Von Eicken who also produced other Dunhill offerings at the time. 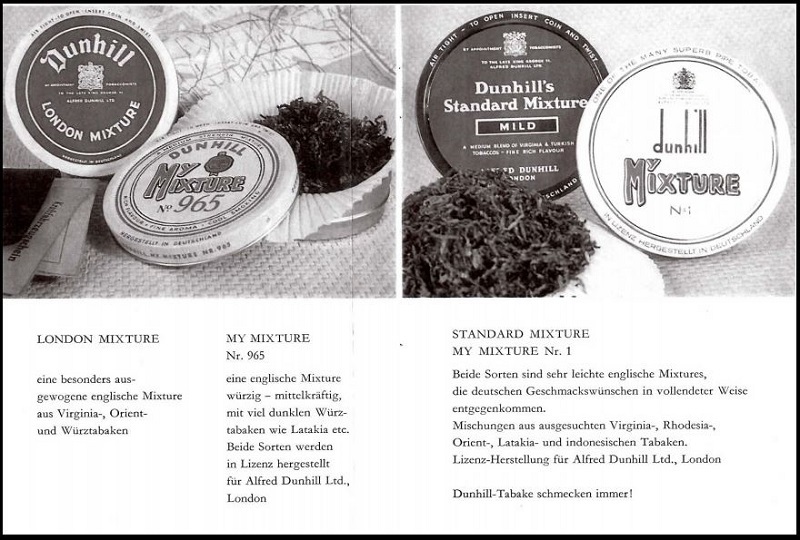 I barely could believe this and as proof an old advertisement for German made Dunhill tobaccos was uploaded on the FDT forum. In a book about old companies from Hamburg I read more about Von Eicken. 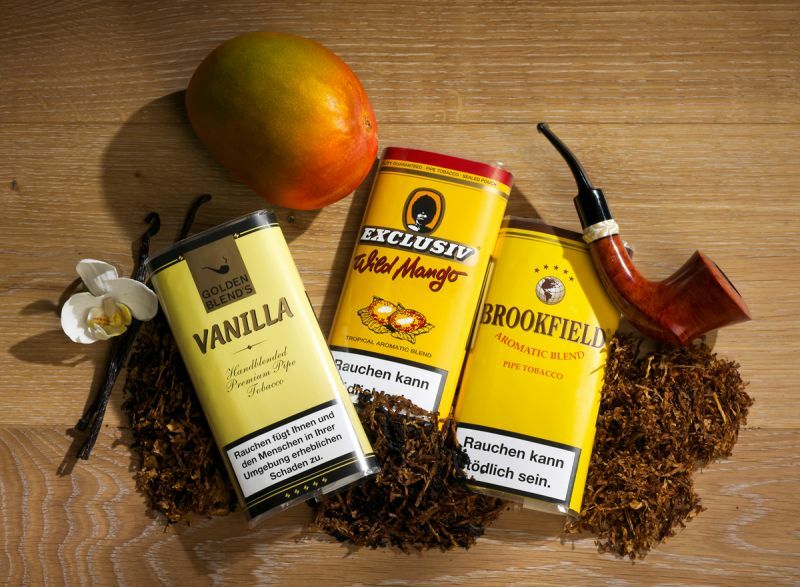 As early as 1770 Johann Wilhelm von Eicken began trading with colonial countries and produced his pipe and snuff tobacco in Mülheim. In 1866 Carl Heinrich von Eicken took over the management of the company. 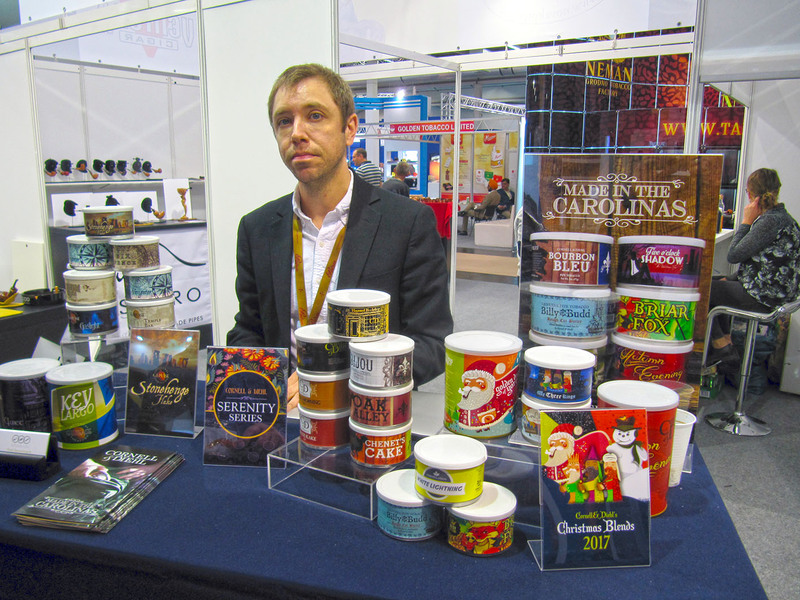 He discontinued trading with the colonial countries and presses ahead with the production of tobacco products. 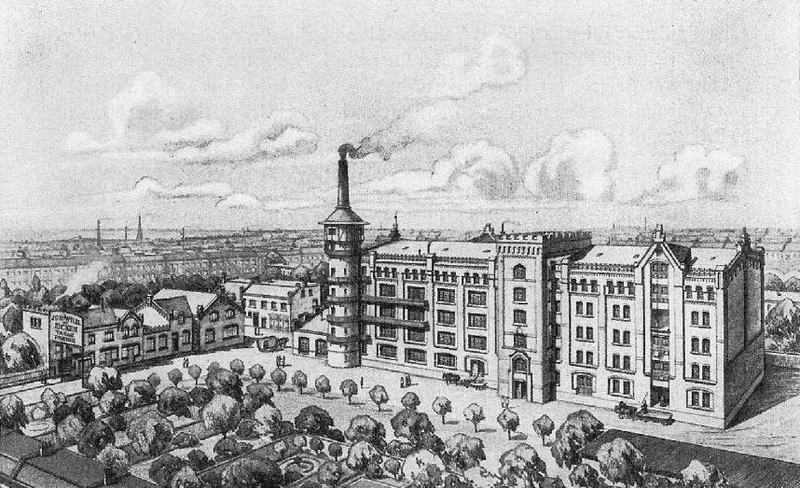 Another tobacco factory in Hamburg was purchased in 1886. The Hamburg factory was not spared in WWII, it was partly destroyed during air raids in 1943. The plant in Mülheim was completely destroyed during air raids by the US Air Force. Shortly before the end of the war the closure of the factory in Hamburg was ordered by the Nazis in 1944. 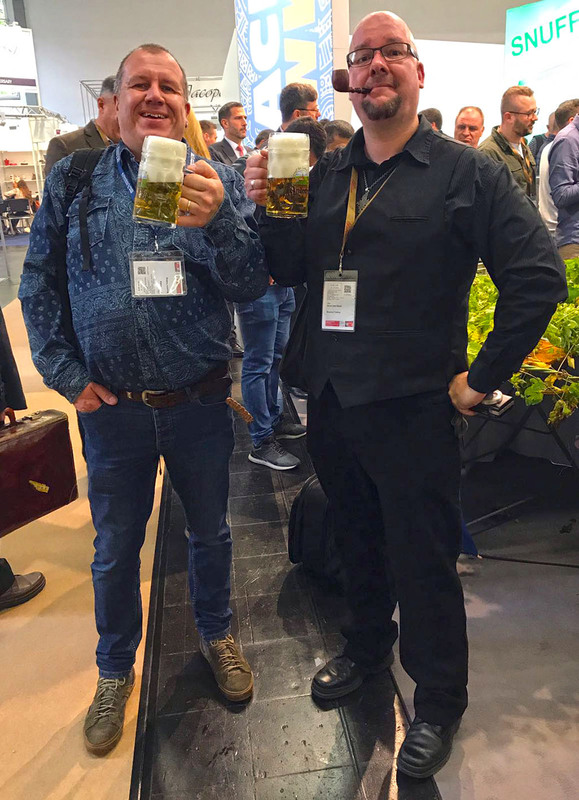 The building was required for the production of X-ray machines.. Old and sick Hans von Eicken handed over the company to his son Wilhelm just a few months before the war ended. 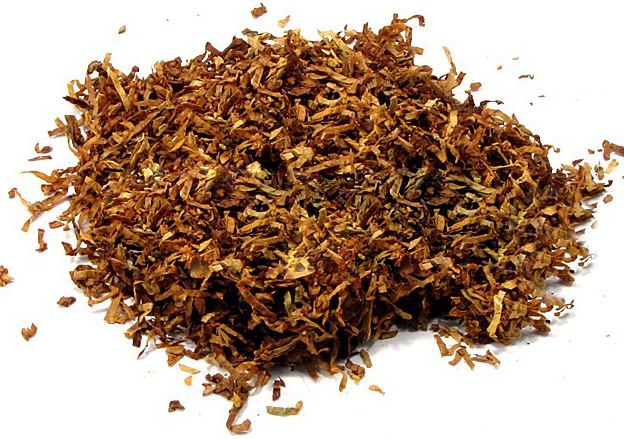 Official permission to resume manufacturing tobacco was granted in 1949. 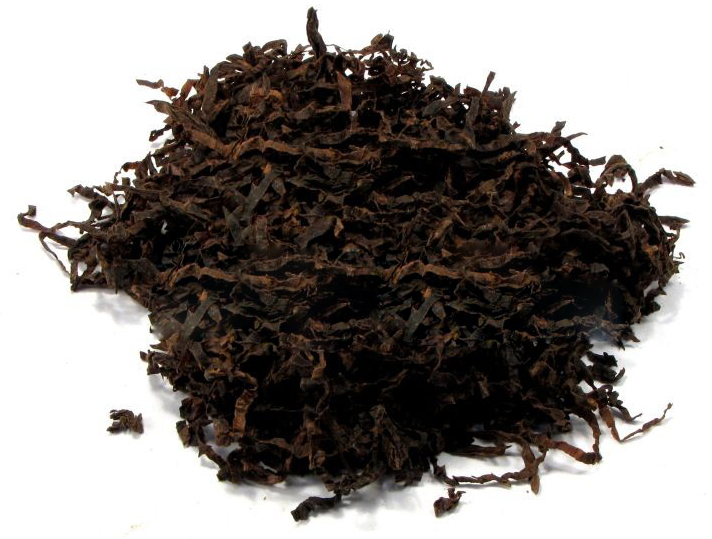 US Virginia tobacco, essential for production, was available in late autumn of the same year because of the Marshall Plan (93,000 tons of tobacco were shipped free of charge to Germany!). 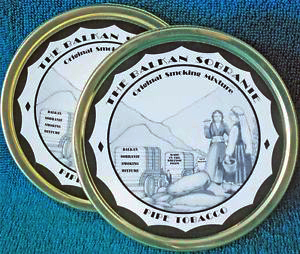 In 1963 Von Eicken was granted the exclusive import and distribution rights for Mac Baren tobacco in Germany and distributed this successfully until 2008. 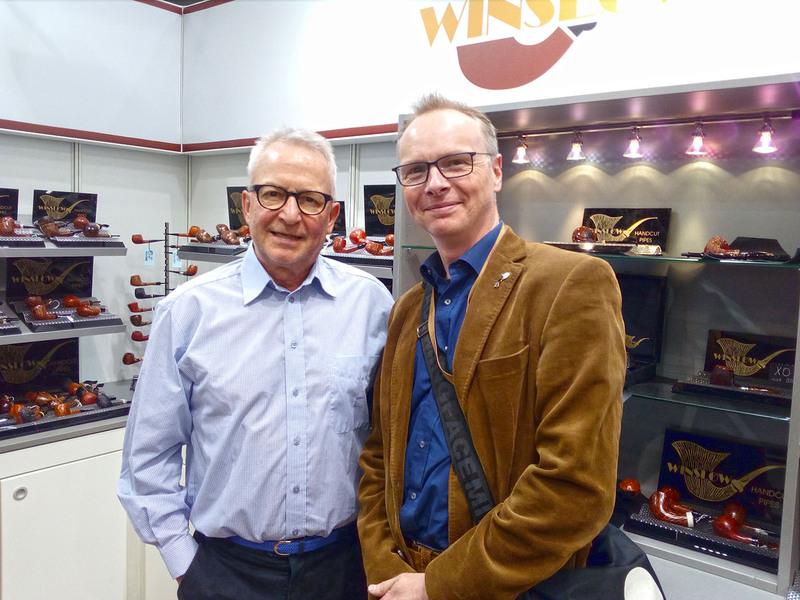 In 1983 the decision was made to relocate the factory to Lübeck. 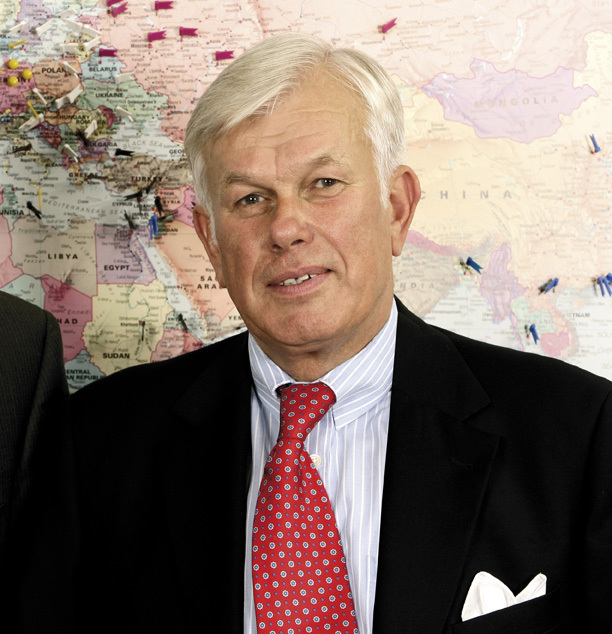 Marc von Eicken was the 8th generation to join the company in 1997. Since then he is running Von Eicken together with his father Johann Wilhelm. 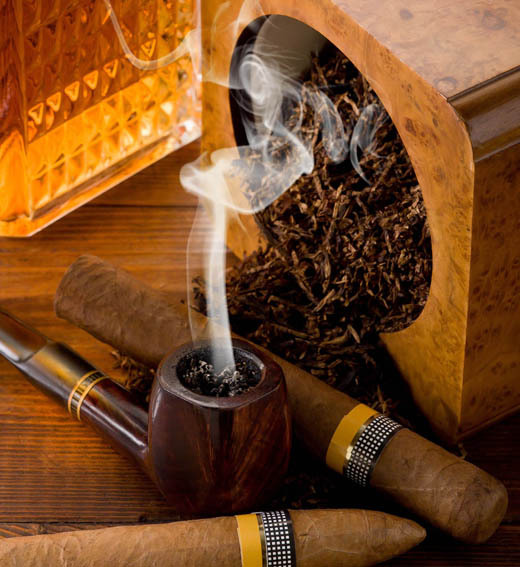 The most interesting thing I read in the book (and saw on the FDT forum) by far was that Von Eicken already made contact with Dunhill in 1926, permission to produce tobaccos in license was granted in 1938. 1938… With a shock I realized that Adolf Hitler reigned over Nazi-Germany in that year. 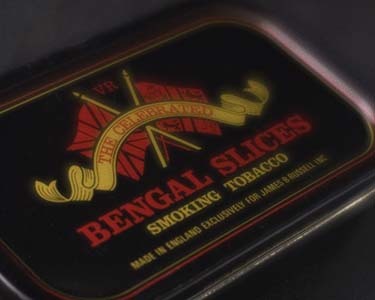 So one of the quintessential British companies gave a tobacco license to a company in Nazi-Germany?? Yes, but it is not as black and white as you read it. In 1938 most Western countries had adopted an optimistic view about what Winston Churchill later called “the gathering storm of war in Europe”. I mean, a policy of appeasement towards Adolf Hitler was initiated in Great Britain by Lord Halifax and US president Roosevelt had signed the US Neutrality Acts. 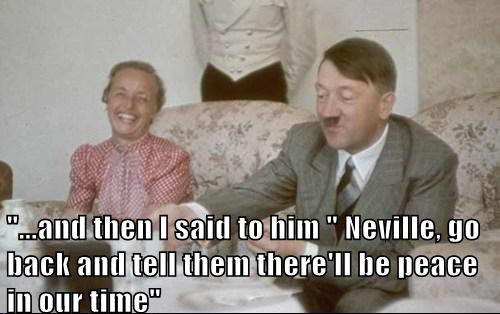 The British Prime Minister, Neville Chamberlain, met Hitler in his Munich flat. Later that day he flew home and waved the joint declaration of peaceful intent, which they both signed. He also remarked that “all this will be over in 3 months” and “I believe it is peace for our time”. 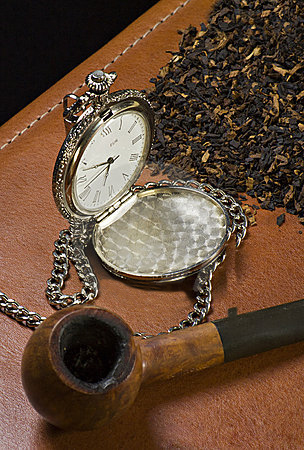 For Dunhill 1938 was a year of consolidation. A royal warrant from the freshly crowned King George VI was received and agencies were appointed for countries around the world. 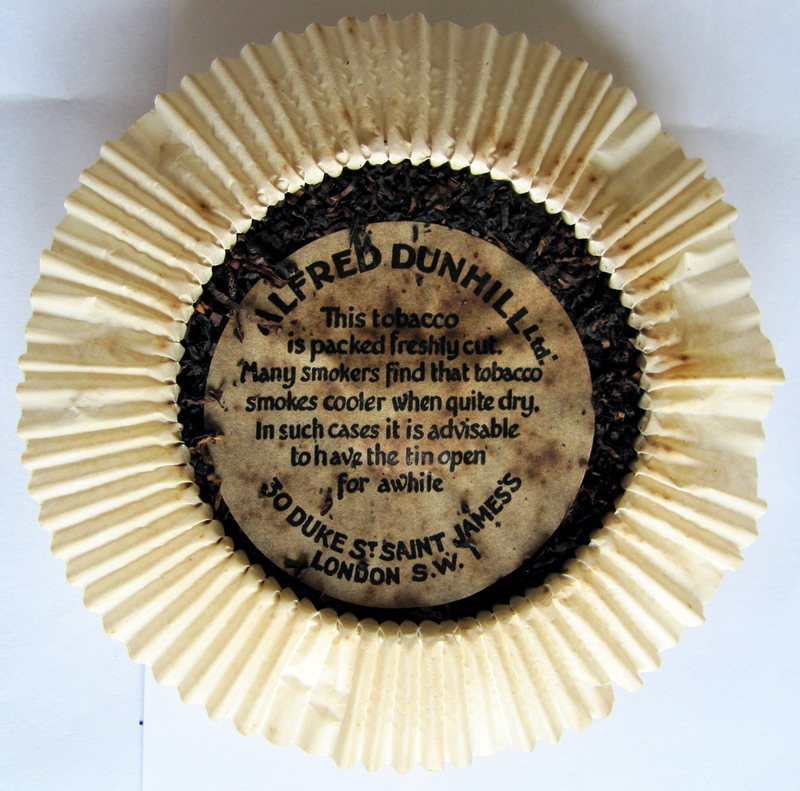 The main agent for Dunhill in London, the firm Abel & Imray, attempted through a local attorney to register the names “Dunhill”, “Rich Dark Virginia”, “Standard Mixture” and “My Mixture” in Germany. Sadly the firm was informed by the German authorities that it could not use its chosen representative because he had been “disbarred from practice” for being Jewish. I guess Von Eicken fitted the bill better. Alas, in the end Hitler’s play for more time (so he could complete his weaponry) was successful. 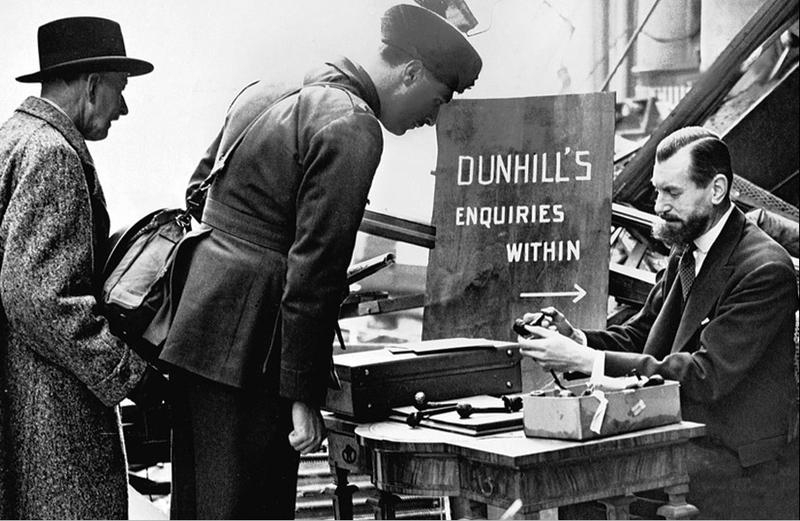 On 3 September 1939 Great Britain and France declared war on Germany and in 1941 the Dunhill store was bombed.. Despite the knowledge at the FDT forum and things I read I still had some questions. So I boldly decided to mail Von Eicken themselves in the hope to verify and gain some information. And lo and behold, a couple of days later I got a mail back from the older director, Herr Johan Wilhelm Von Eicken. His answers were very short, sometimes I did not know what he precisely meant but anyway, I was thankful. Below are the questions I had and the answers to the best of my abilities. 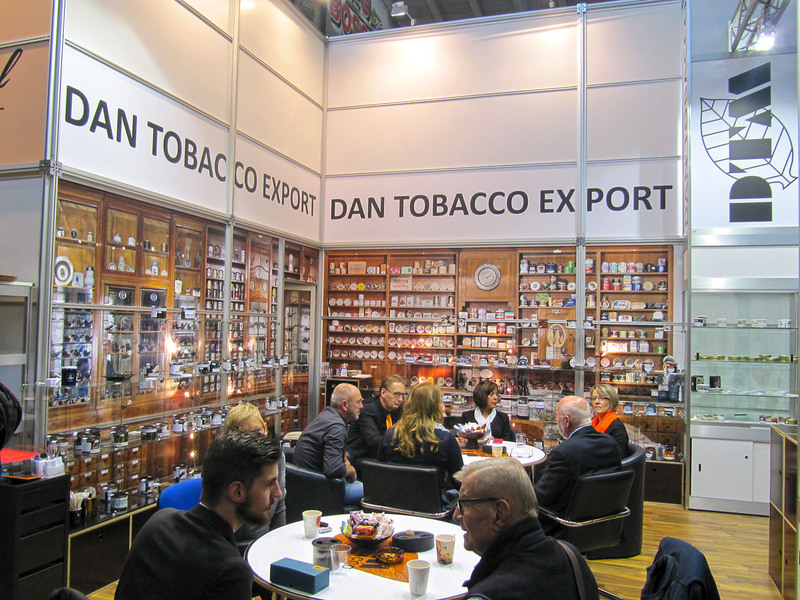 Why did Dunhill give a license to produce their tobaccos to Von Eicken? 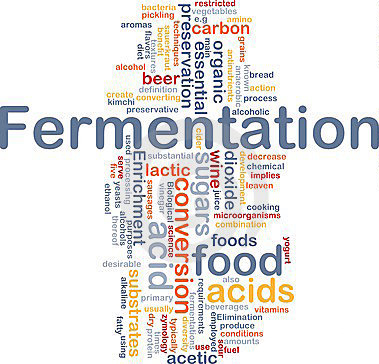 The answer is pretty simple: economical reasons. In 1929 Dresden internist Fritz Lickint presented statistical evidence through a published case-series study which linked lung cancer and tobacco usage. So the Nazis began one of the first public anti-smoking campaigns in modern history. 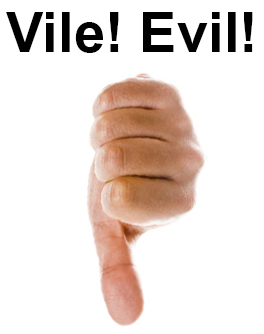 Hence the term “anti-smoking Nazis”.. A motivating factor was Adolf Hitler’s personal distaste for tobacco. 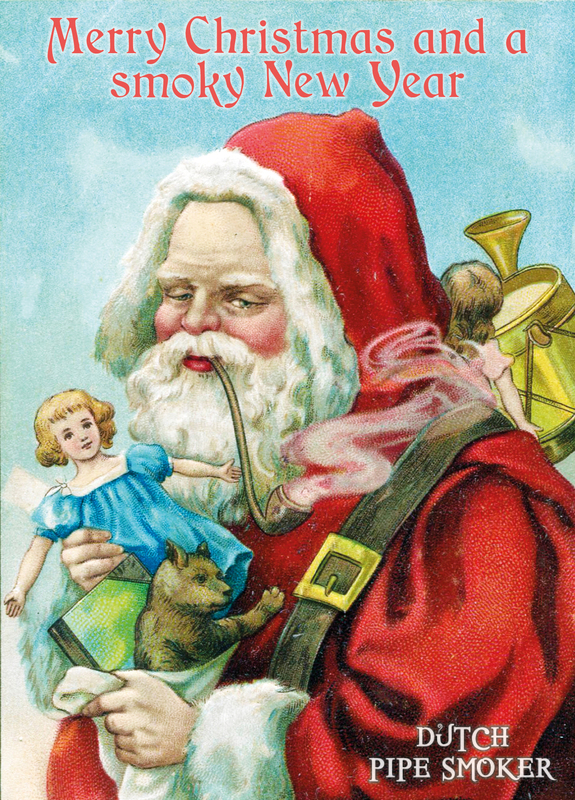 Despite the fact that he was a heavy smoker in his early life. He used to smoke 25 to 40 cigarettes daily but gave up the habit, saying that it was “a waste of money”. Another motivation behind the Nazi campaign against smoking were their reproductive policies. 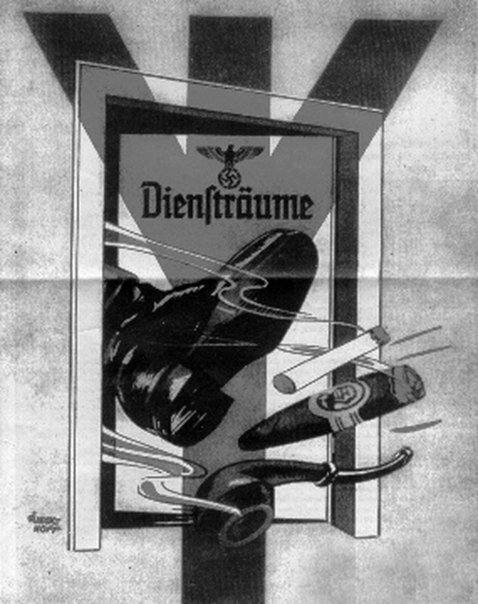 The campaign included banning smoking in trams, buses and city trains, promoting health education, limiting cigarette rations in the Wehrmacht, organizing medical lectures for soldiers and raising the tobacco tax. So to get their tobaccos to the German consumer Dunhill first had to import their tobacco into Germany and pay import-duties. 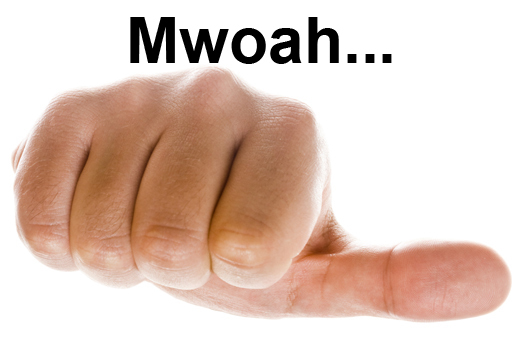 And on top of that the increased tobacco-tax made their offerings even more expensive. But with the tobacco made in Germany they avoided the import duties, enter Von Eicken. 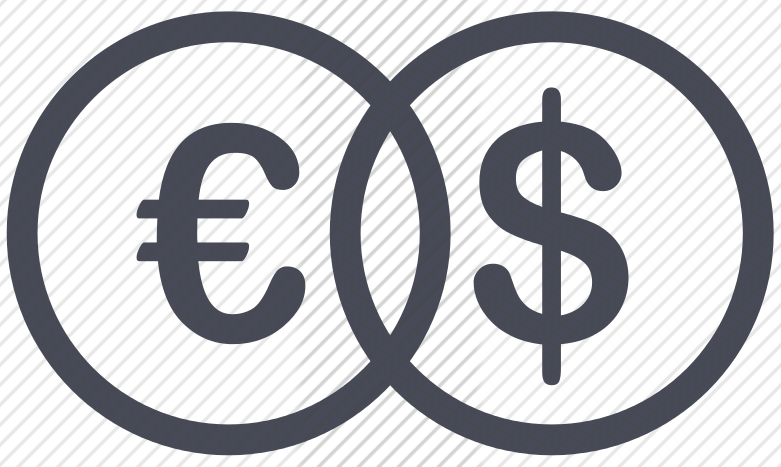 After the war the Deutsche Mark had little value as opposed to the British Pound thus everything coming from Great Britain was expensive. 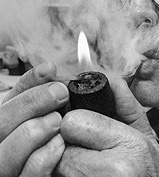 So once again The Von Eicken factory came in handy for Dunhill. 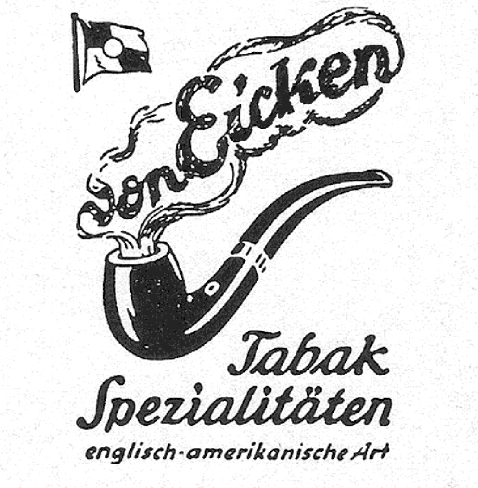 Did Von Eicken use the same recipes as the original London made ones? Did Von Eicken kept producing Dunhill tobacco in Nazi Germany until 1943, when their factories were bombed by the allied forces? 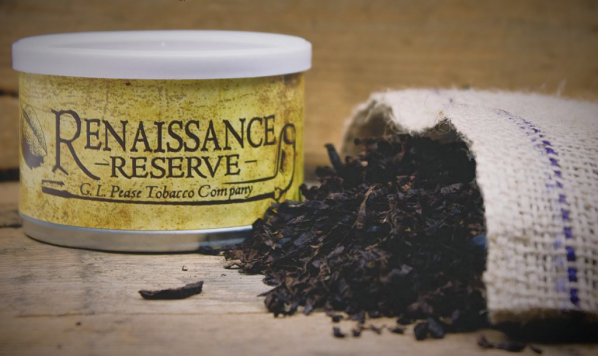 According to Herr Von Eicken there was no leaf tobacco available in the war, so, no. 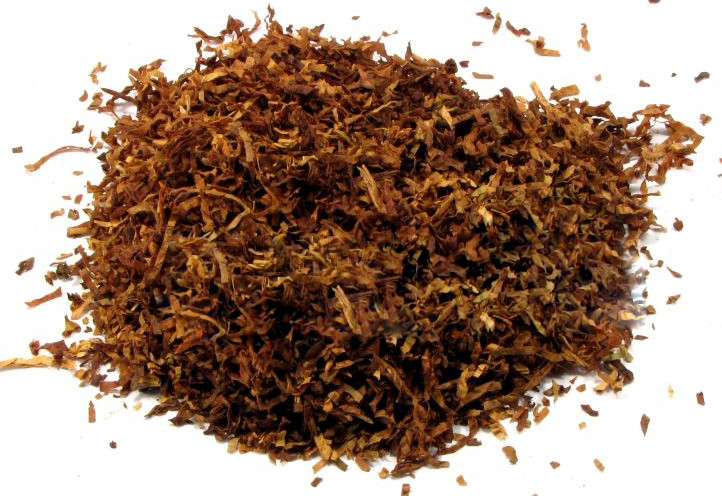 Tobacco rationing was imposed in the beginning of the war and almost 70% of the available smoky leaf was diverted to the armed forces for the remainder of WWII. 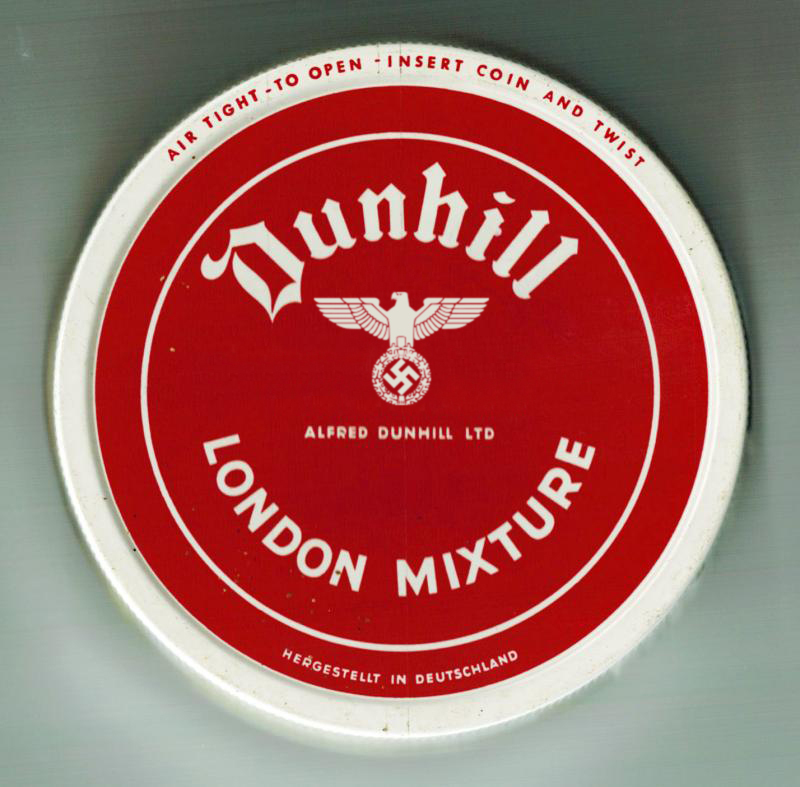 Also I can’t imagine that such a luxury product as Dunhill tobacco was bought by the struggling German population. But one has to admit, it is a tantalizing thought that perhaps some tins were made at the end of 1938 and beginning of 1939. 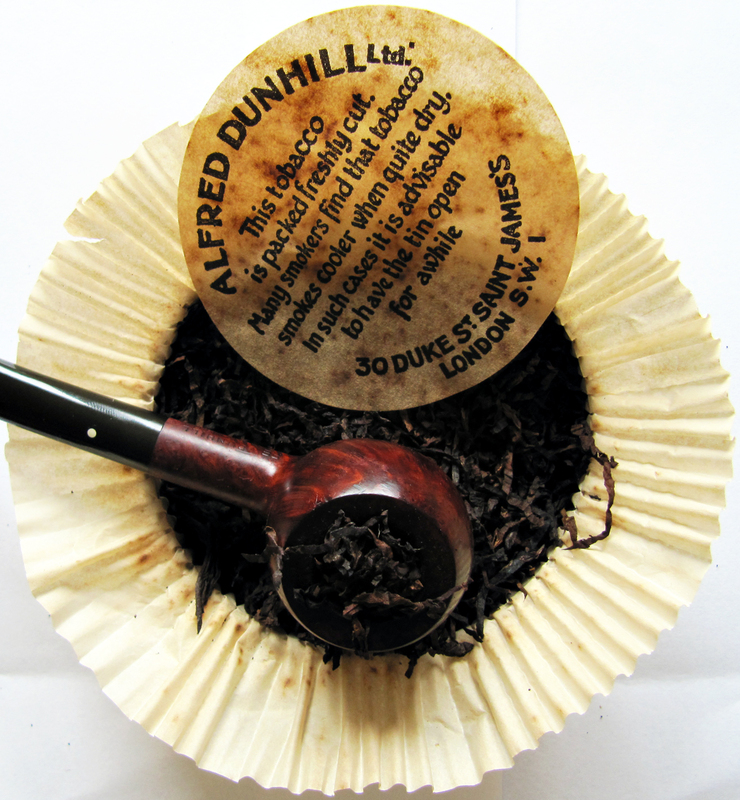 That would really be a kind of sinister holy grail of Dunhill tobacco. 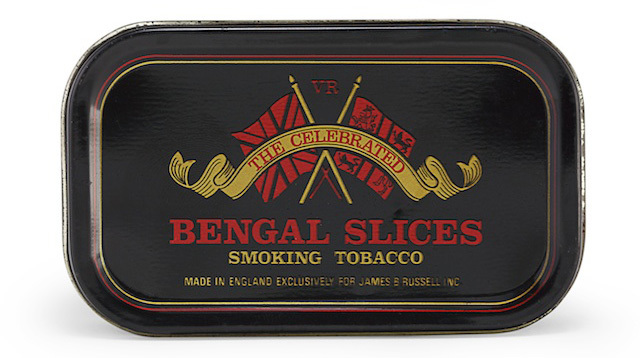 When did Von Eicken stop producing Dunhill tobacco in license? 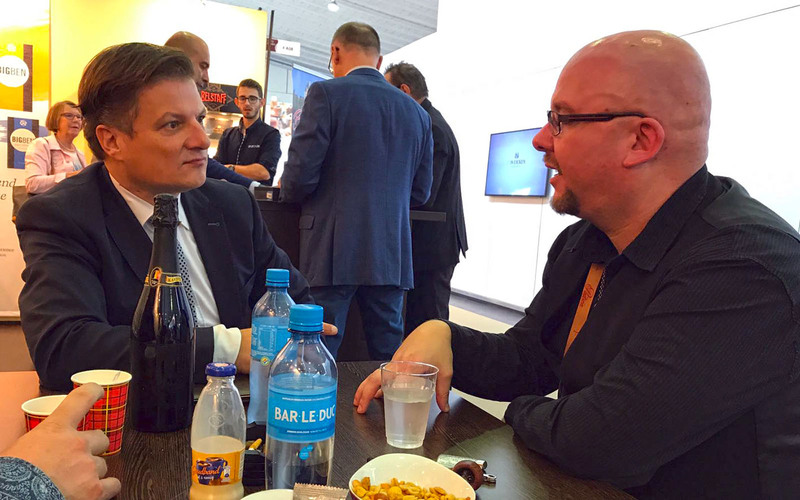 Once again I had to lean on Rainer because I did not understand the answer of Herr Von Eicken.. 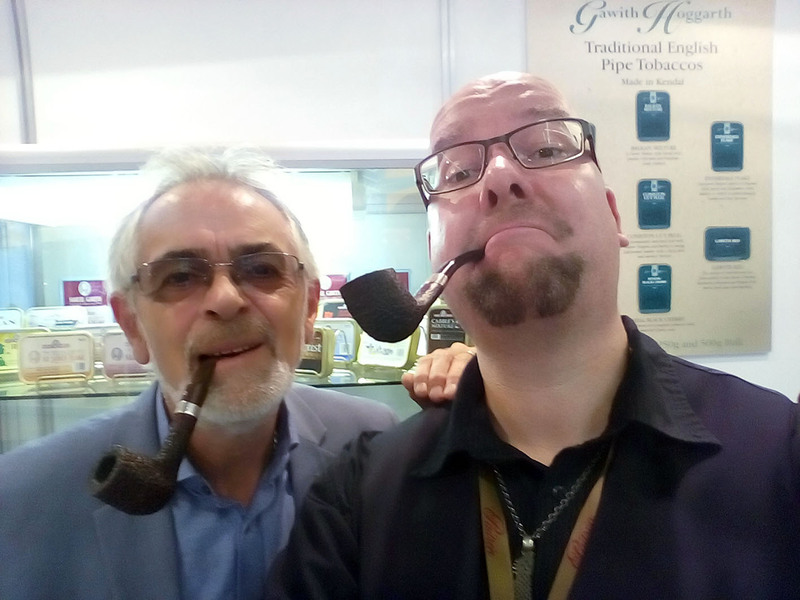 According to Rainer sometime before 1976 when he started to buy pipe tobacco the original Dunhill tobaccos became available in Germany and Von Eicken ceased their production. 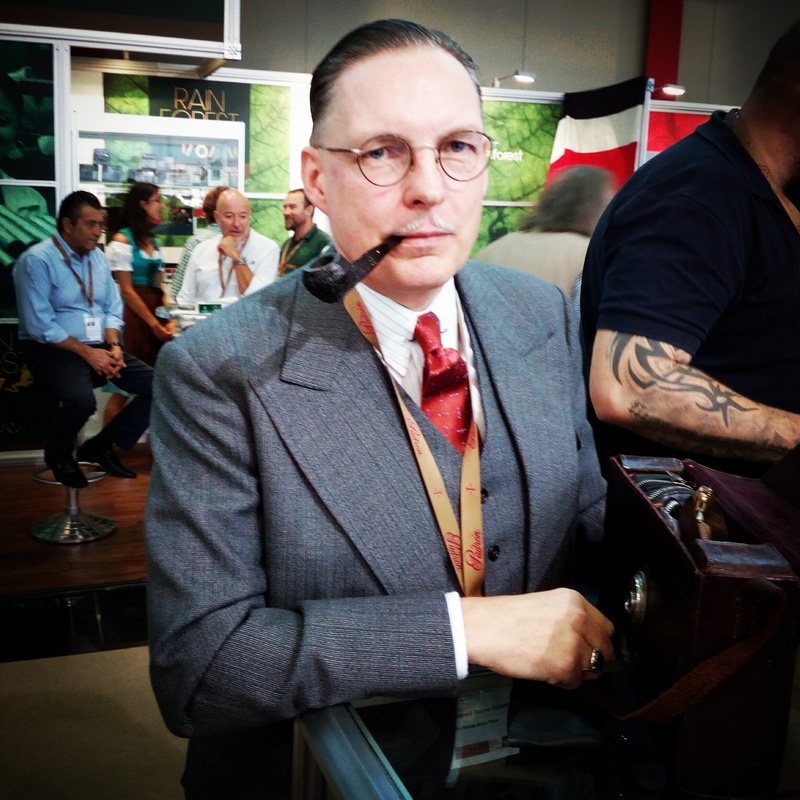 Perhaps Dunhill noticed that a lot of German pipe-smokers bought their tobaccos abroad.. Who knows.. One thing is sure, when Murray took over Dunhill production Von Eicken no longer made their version. Back to the tin of German London Mixture I bought. You can see a George VI crest with a reference to the “late King”. So according to John Loring this tin was made between 1954 and 1962. 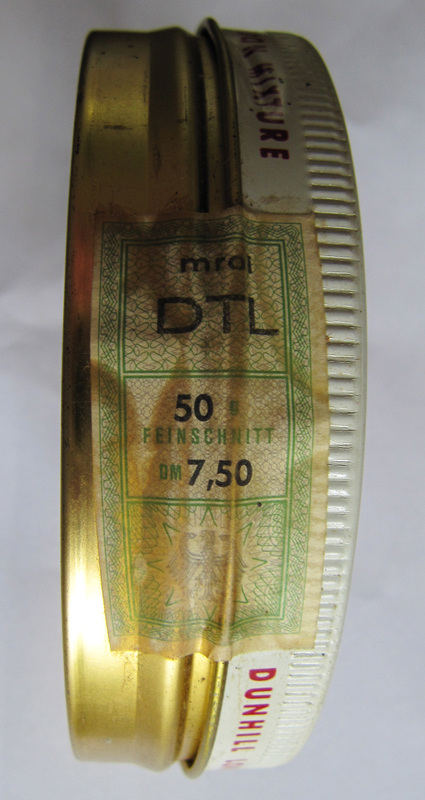 Personally I believe it is closer to 1962 than to 1954 because of the price you see on the tax-seal, DM 7,50. 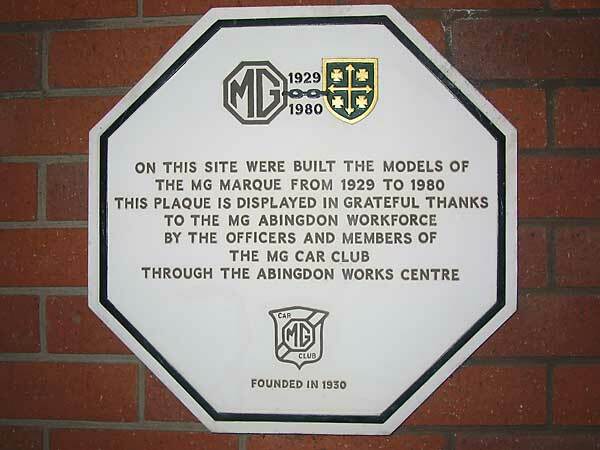 This because Rainer says that halfway the 1970’s such a tin costed around DM 8,00. 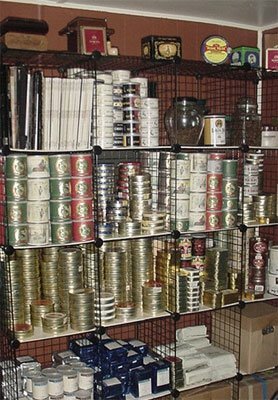 But still, in the “worst case scenario” my tin is 52 years old, yiehaaa!!! With the paper insert removed the tobacco looked just fine in my eyes. No mould or anything like that, just mostly dark coloured ribbon cut strands with some lighter ones. 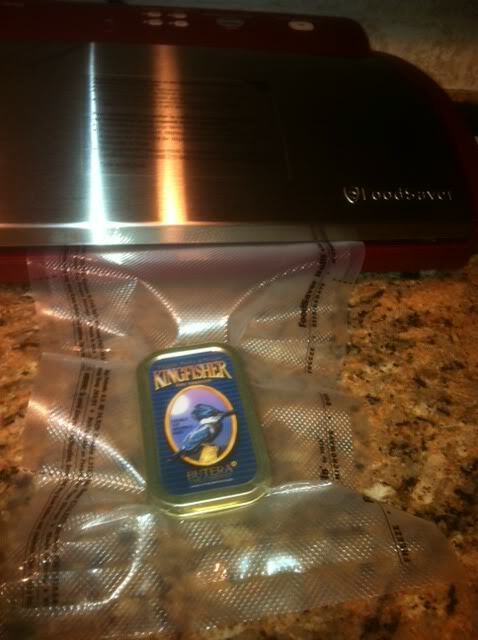 Despite that the vacuum seal had been intact the contents were a little bit on the dry side but still perfectly smokeable. The smell of the tobacco inside was a bit strange. 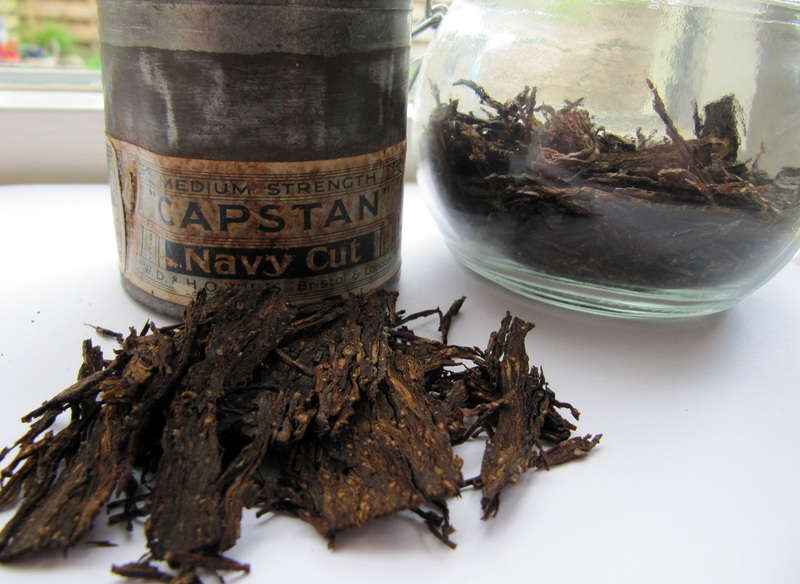 I noticed that the strength of the latakia had diminished and what was left is best described as a McClelland latakia tobacco with instead of the ketchup odour a bit of a sweet liquorice smell with a rotten edge. 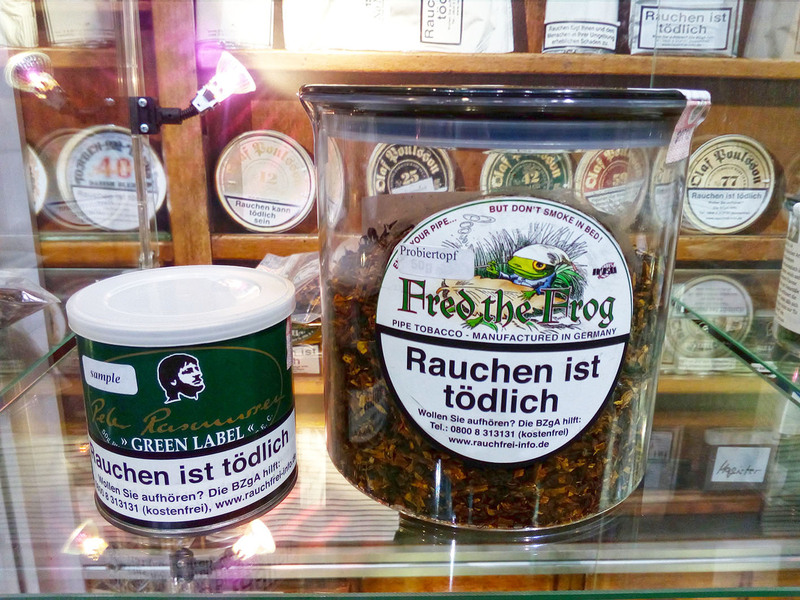 The original Dunhill tobaccos were (in)famous for their “rotten” smell so probably Von Eicken tried to mimic this. 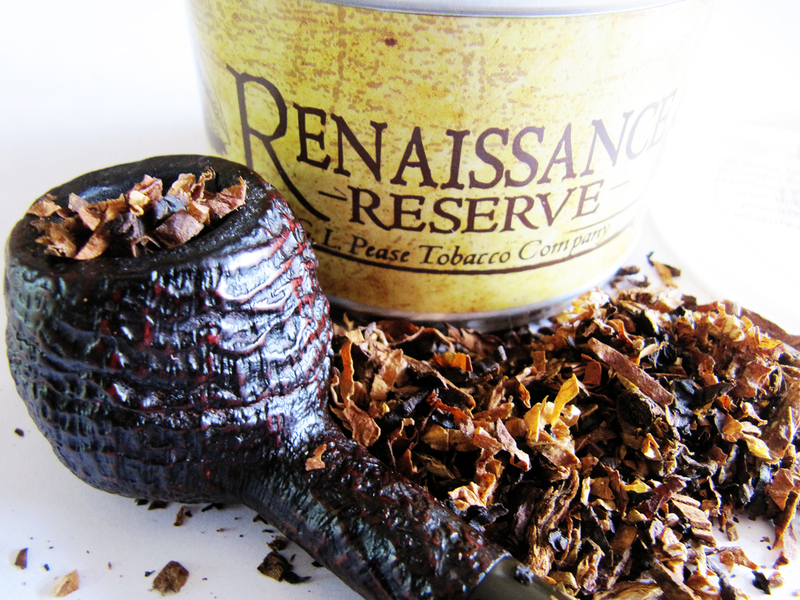 I filled a 1962 Root Briar Dunhill prince with the German London Mixture and set fire to the old tobacco. I was aware that people said that the German version was awful compared to the original but all by all I had a decent smoke. Nothing spectacular but just.. Decent.. I had no old original London Mixture tin so comparing it was difficult. Only thing I had was a tin of the Murray version, so in the next days I also smoked that one. In the afternoon the Murray version, in the evening the Von Eicken one. 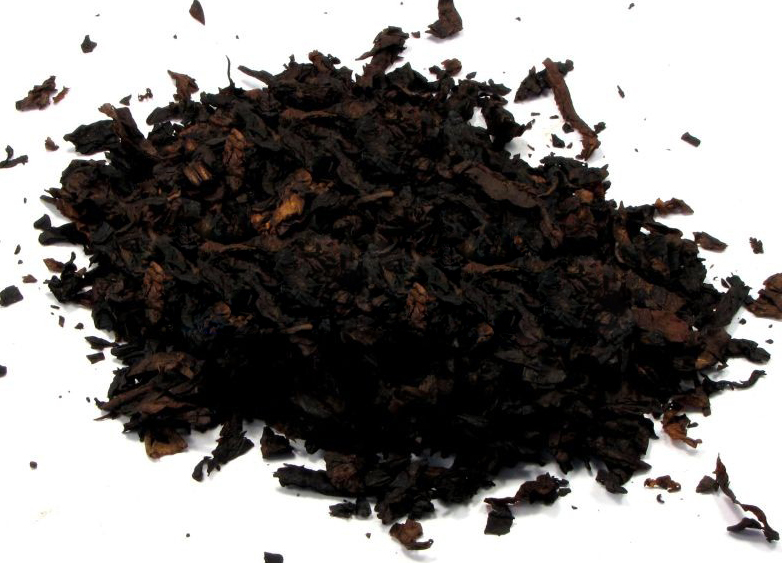 Of course the Murray tobacco was fresher, the latakia more present and pungent. But when I adjusted the taste in my mind I found some similarities. 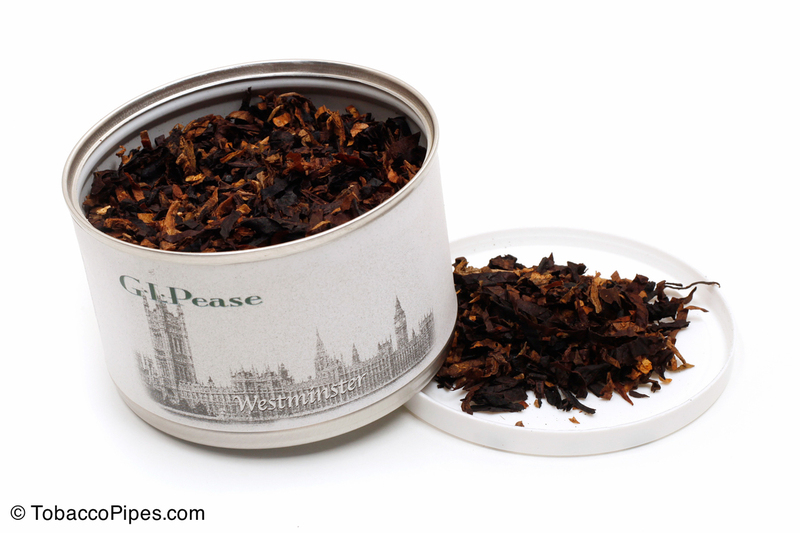 The original description for London Mixture read: “A delightfully harmonious blend of matured Virginia and Oriental tobaccos, soft and mellow, cool and fragrant.” Mr Pease said about the original: “It had a richness, a sophisticated elegance, and a complex nature that kept it from being tiring. It was full enough to satisfy, but never overbearing. 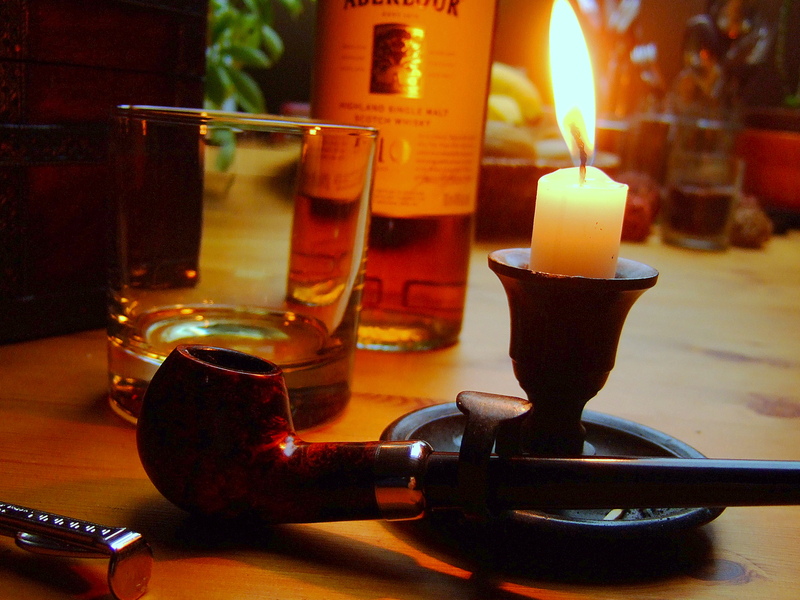 It was comfort food for the pipe.” I could find myself in these descriptions. 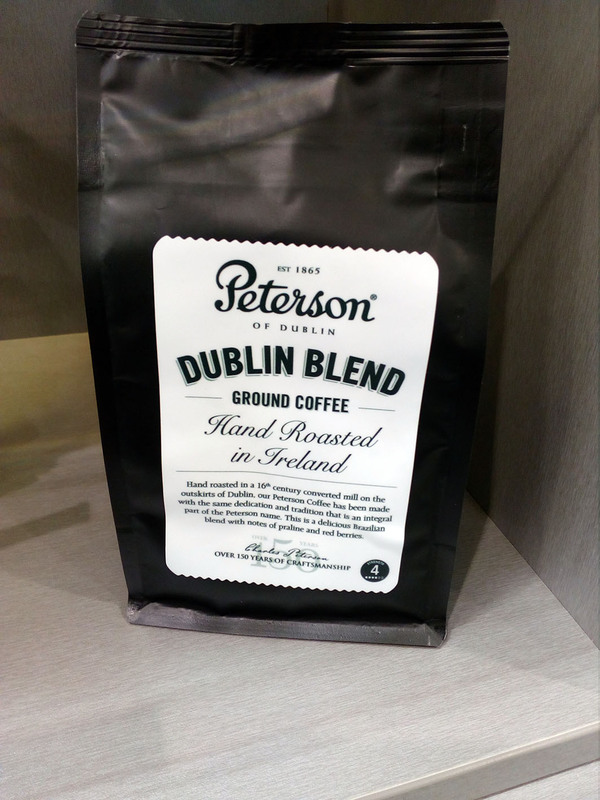 Both blends were very harmonious, one good taste throughout the bowl without a roller-coaster ride of different flavours, comfort food. The Murray version had a certain richness and was soft and mellow. On the other hand The Von Eicken blend bit me sometimes and lacked the complex nature. 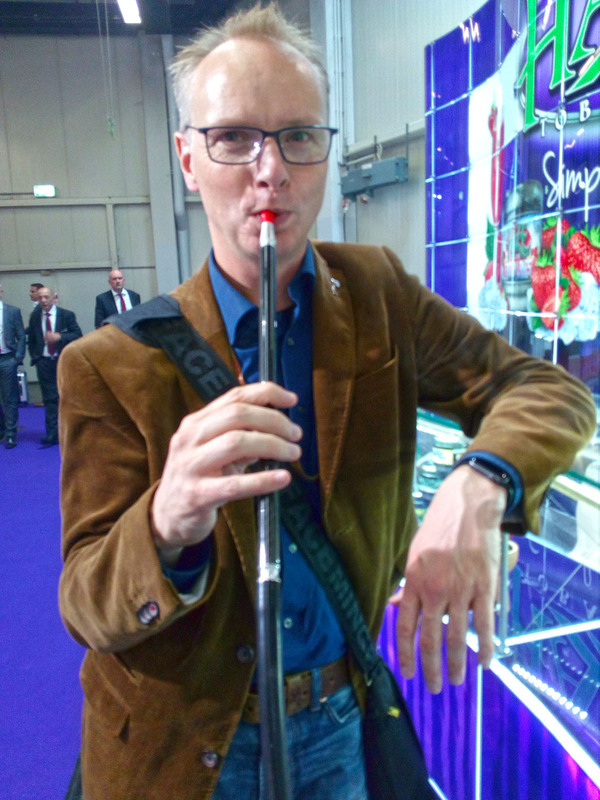 All by all it was a fascinating experience smoking the German made London Mixture. Especially with the story behind it. 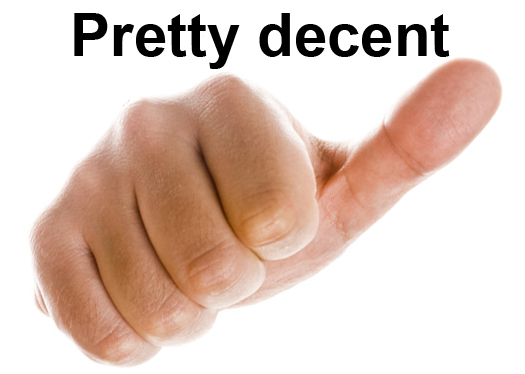 I would like to thank Huub, Rainer, the folks at the FDT forum and Herr Von Eicken for their help and input. 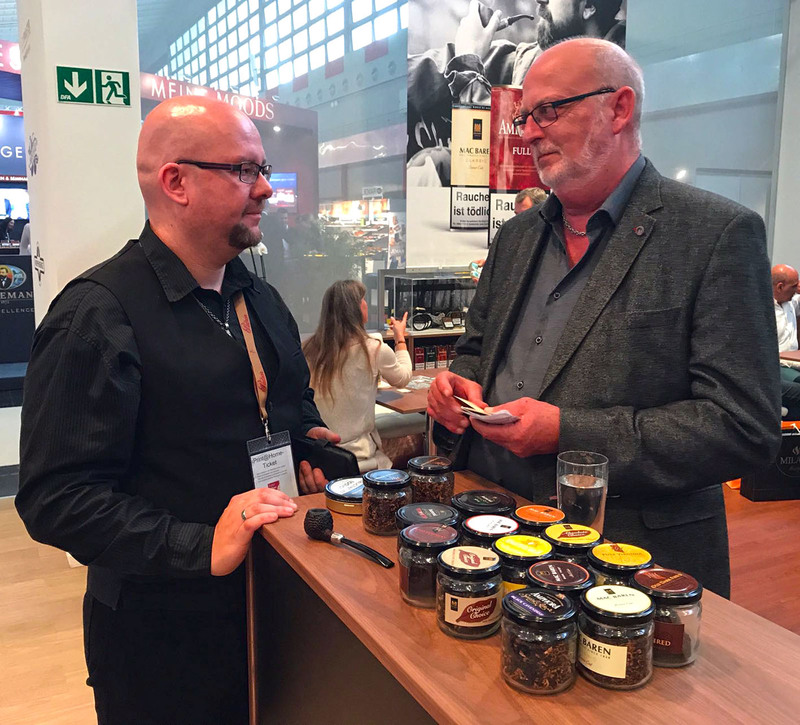 When I first contacted master-blender Hans Wiedemann from HU Tobacco at the beginning of 2012 I asked him if it was possible to receive some samples of his blends. 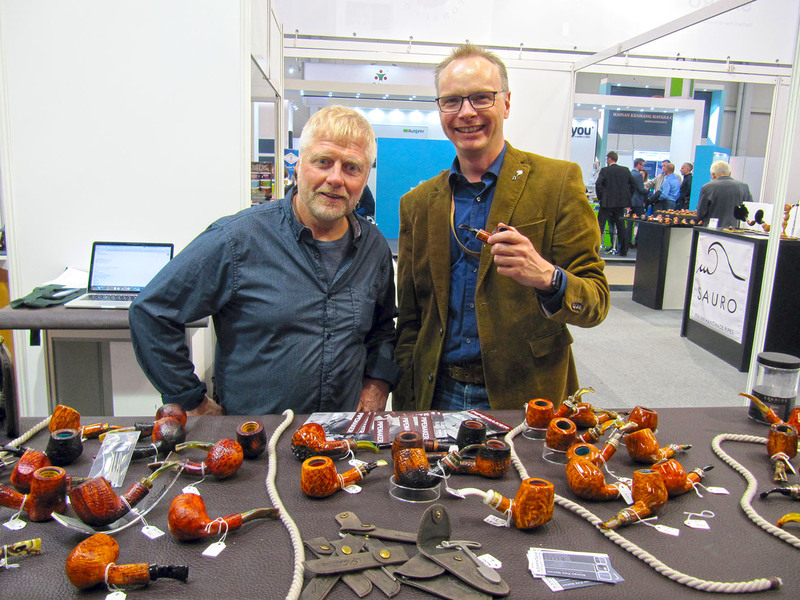 From fellow Dutch pipe-smokers forum members Smoking Rob and Huub I had heard and read some positive things about Hans’ mixtures, so I was very curious. 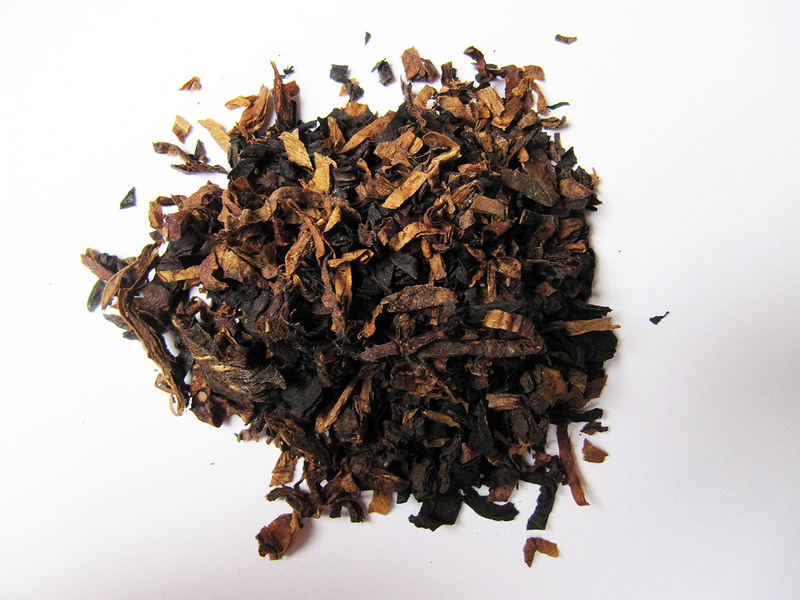 I mainly ordered samples from latakia blends. All blends were good but there were 2 “touchdowns”. 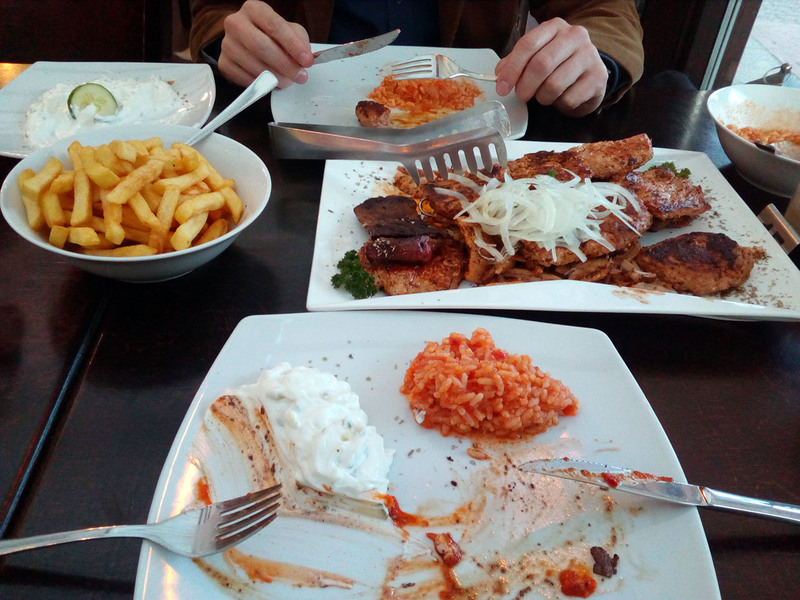 One of them was Balkan Passion and the other one Olaf’s Favourite English. 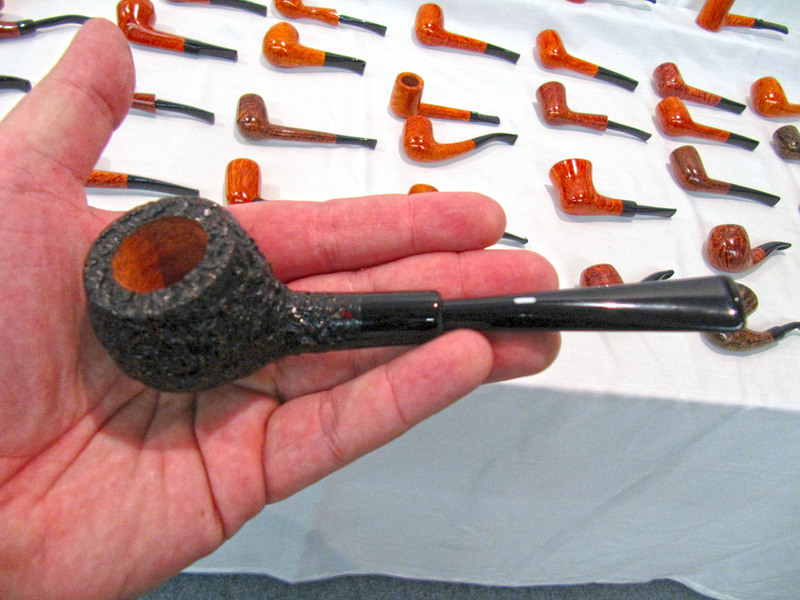 It was made by Hans for pipe artist Olaf Langner, who prefers solid English mixtures for his smoking den. That sounds just like my cup of (lapsang souchong) tea! Package: Olaf’s is only available in typical German 100 gram “paint” tins. 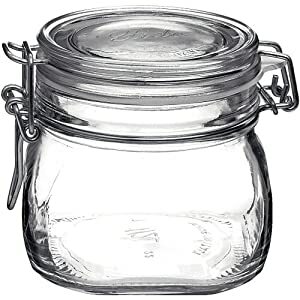 This because of the lid which resembles that of a paint tin. 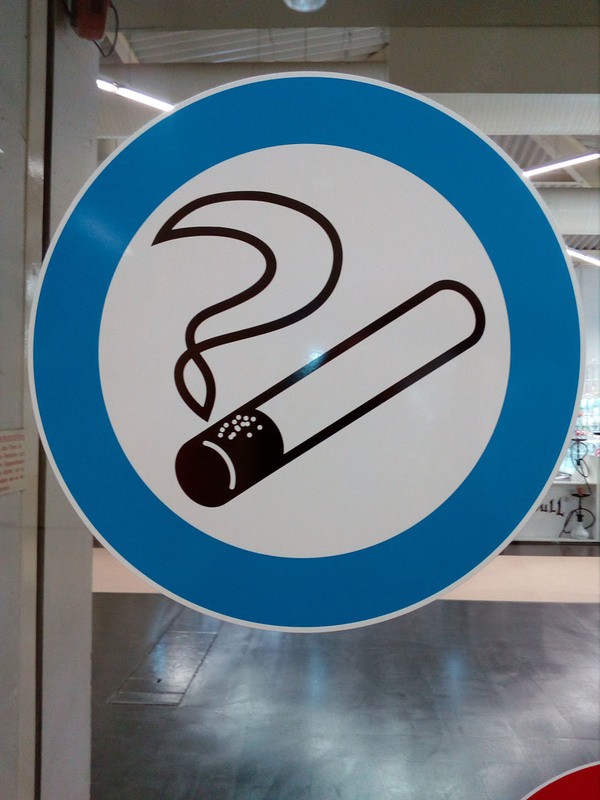 Ideal if you ask me, because it keeps the tobacco fresh for a long time. I opened my tin half a year ago (I have more tins open and I only smoke 2 pipes a day) and the little tobacco left inside is still as moist as the moment I first popped the lid. 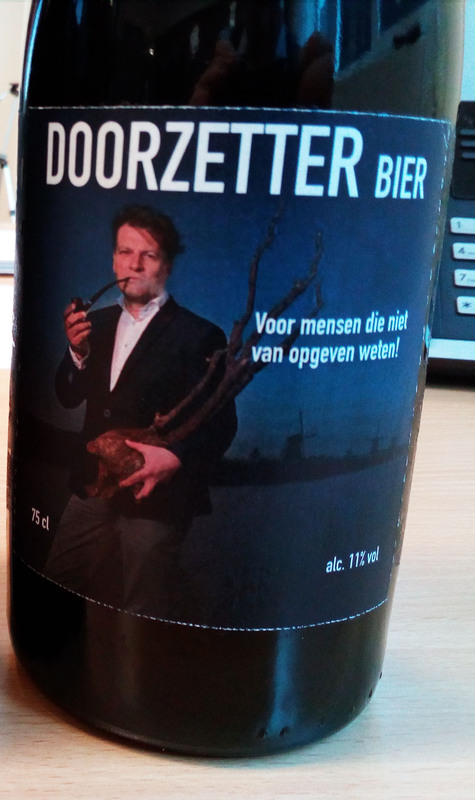 On the front is a nice drawing of Olaf and the name of the blend, on the backside a description of the contents. 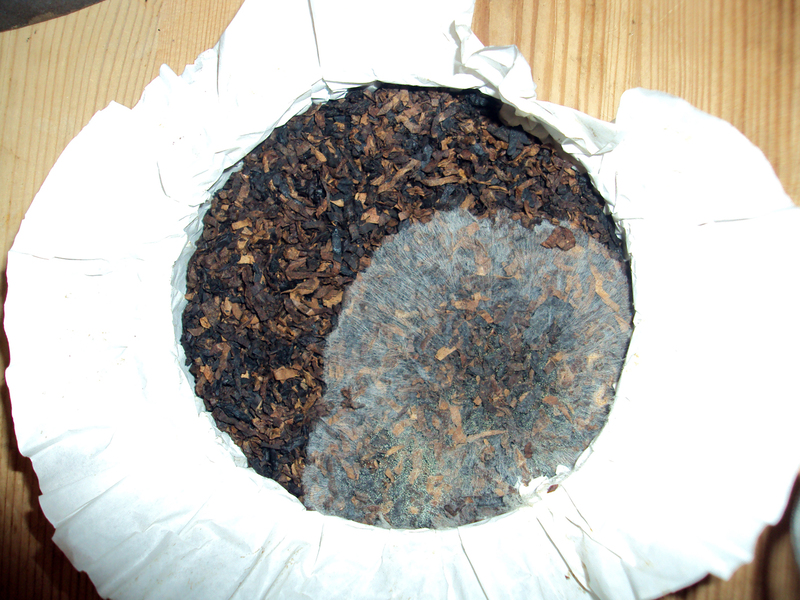 Inside on top of the tobacco is a paper insert with an illustration of a compass on it. The sign the mixture inside was blended and tinned by DTM. 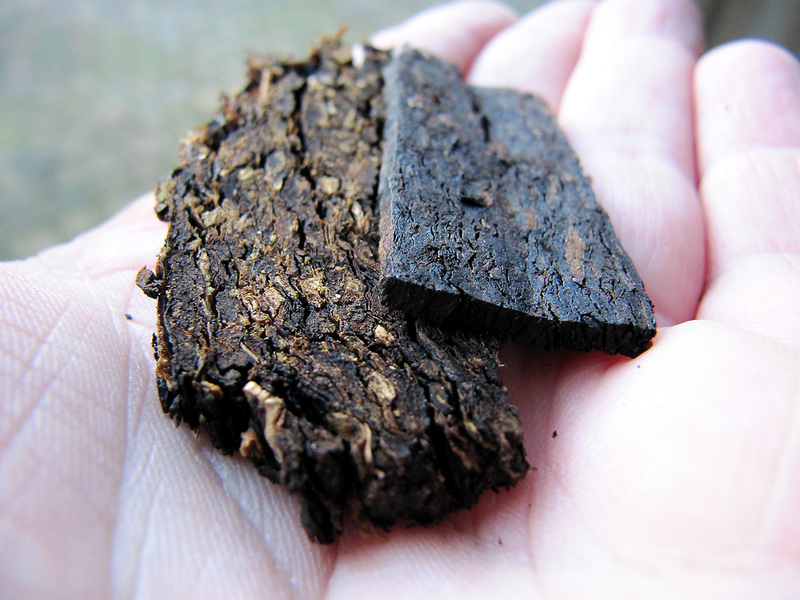 Contents/composition: A sweet base of Virginias, 40% Syrian latakia, 10% Cyprian latakia, perique, quite a bit of Smyrna oriental, darkfired leaf and English black cavendish. Whooo Arno.. In your blog-post Syrian latakia you said that there is almost nothing left of that dark leaf! That is true and despite the contents description there is no Syrian latakia in Olaf’s. 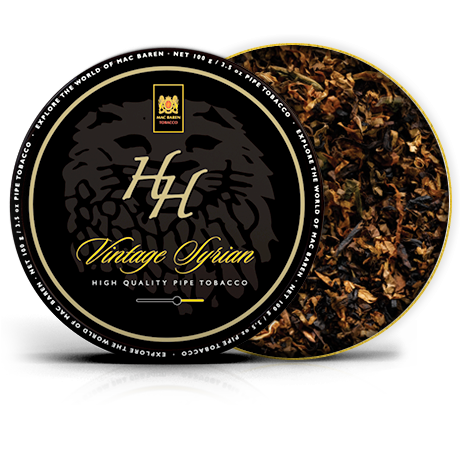 I smoked the mixture a couple of times and could not detect the Syrian leaf I know from blends like 3 Oaks Syrian and Wilderness. So I mailed Hans about this and asked if he could verify the use of Syrian latakia. A couple of e-mails further I read that DTM reluctantly acknowledged there was no Syrian dark leaf inside Olaf’s. 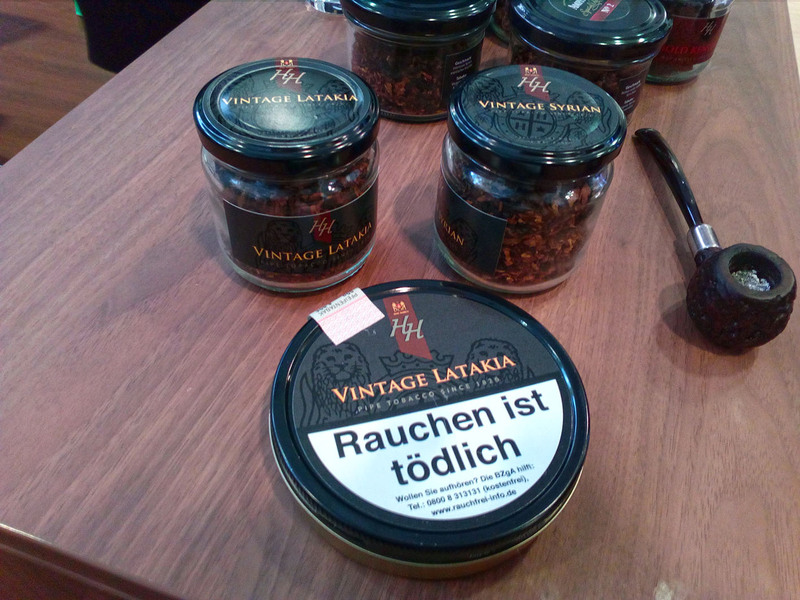 So from now on 50% Cyprian latakia is used in the blend. Oh, don’t be afraid the taste has changed because of this. 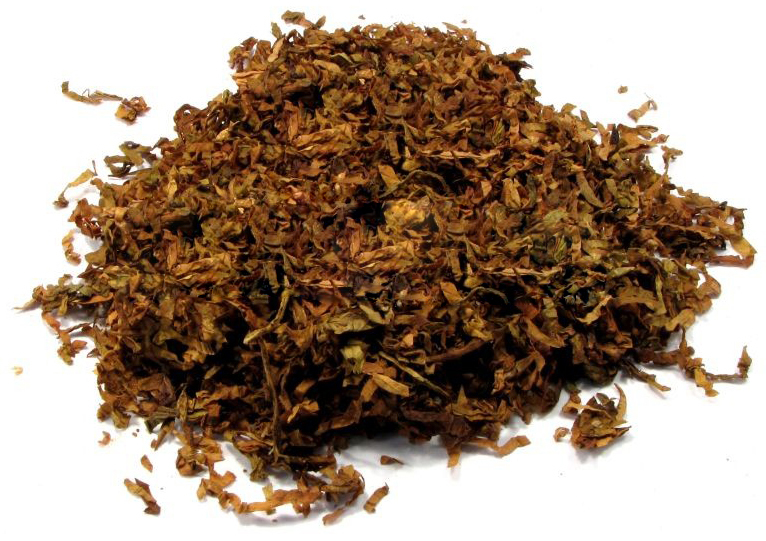 I smoked some of a new batch and it was the same as the old one.. 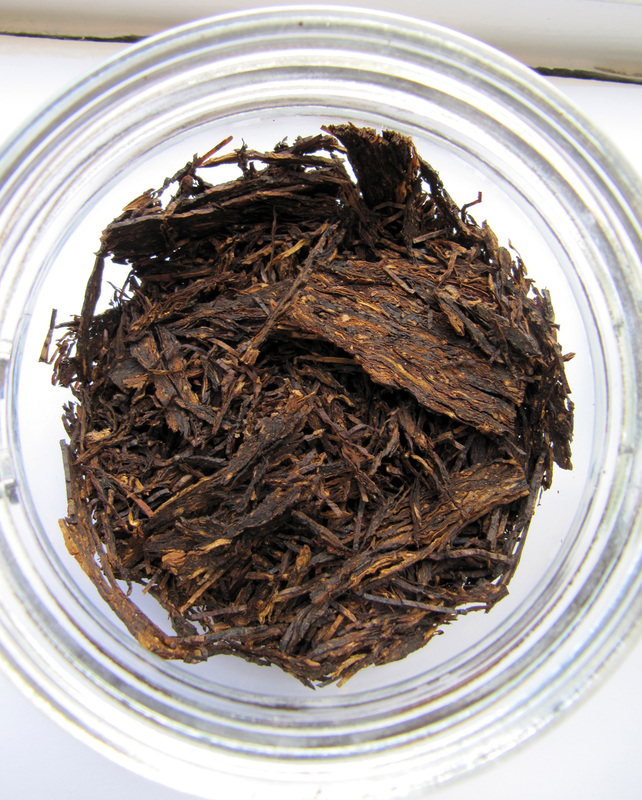 The tobacco itself looks dark with some blond strands and is mainly a ribbon cut with some small chunky pieces which make for easy packing. 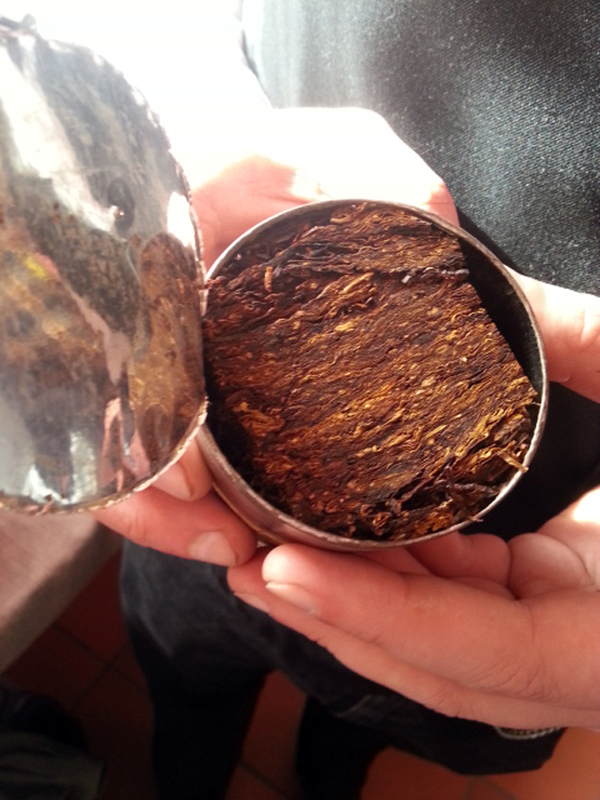 Smell from the tin: A classic latakia mixture smell arises from the opened tin. Sweet, bitter, sour, salty and smoky notes. However, between these I detect something I can’t really define, a bit mushroom like odour. 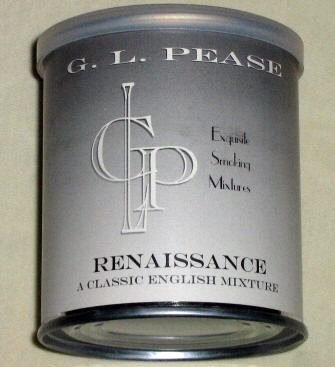 The only blend in which I smelled this before was GL Pease Lagonda. Taste: With a lot of latakia mixtures there is a bitter taste at the charring light. Not with Olaf’s. 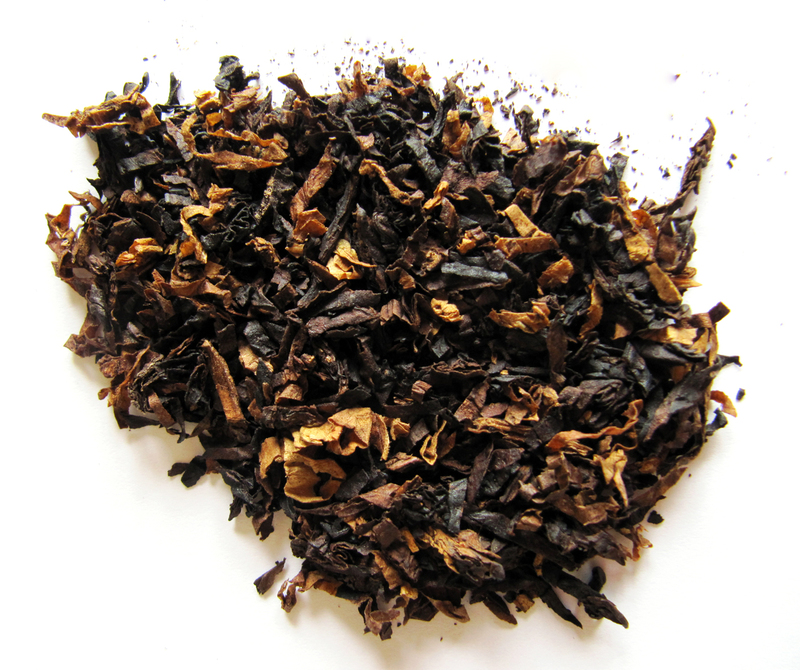 The latakia makes itself known but does not overpower, it provides a kind of full roundness of taste together with the darkfired leaf in which the Virginias can develop. It is not a latakia-bomb. Halfway the bowl the sourness of the Smyrna takes the upper hand a bit which combines nicely with the underlying Virginias and latakia. I know there is perique in the mixture but I think I get more of the spicy pepper side of it than the fruity side. 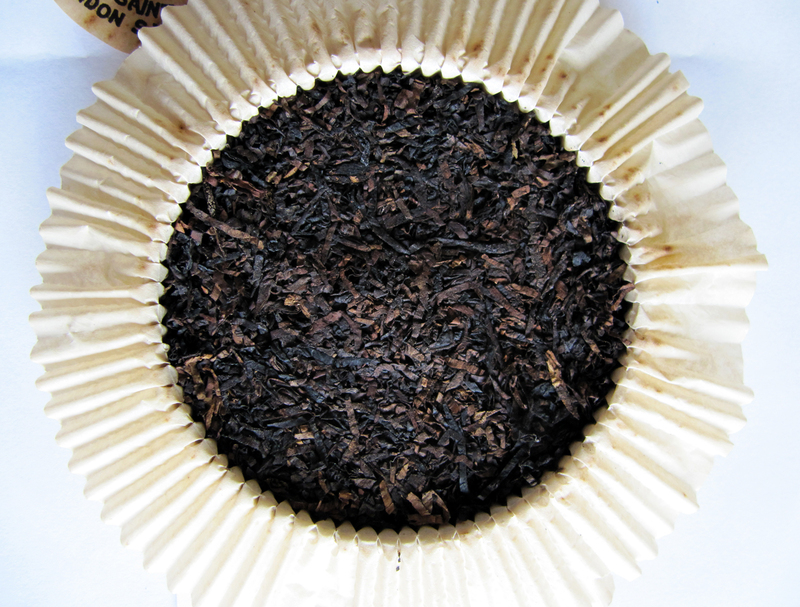 Although… At three quarters of the bowl the smoky and salty latakia is a bit tuned down by the black cavendish. What I then taste I can best describe as a bit salty liquorice with a honey-sweet edge. 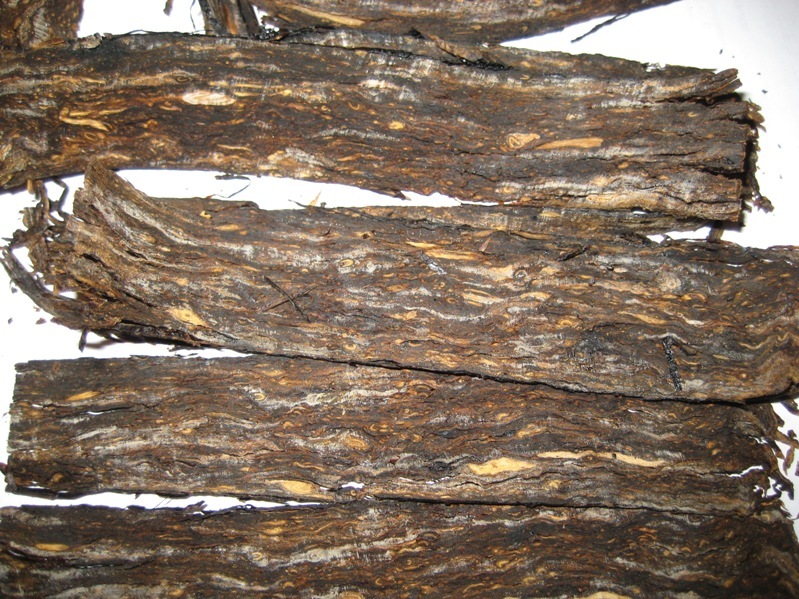 Maybe that is caused by the combination of the perique and the black cavendish. 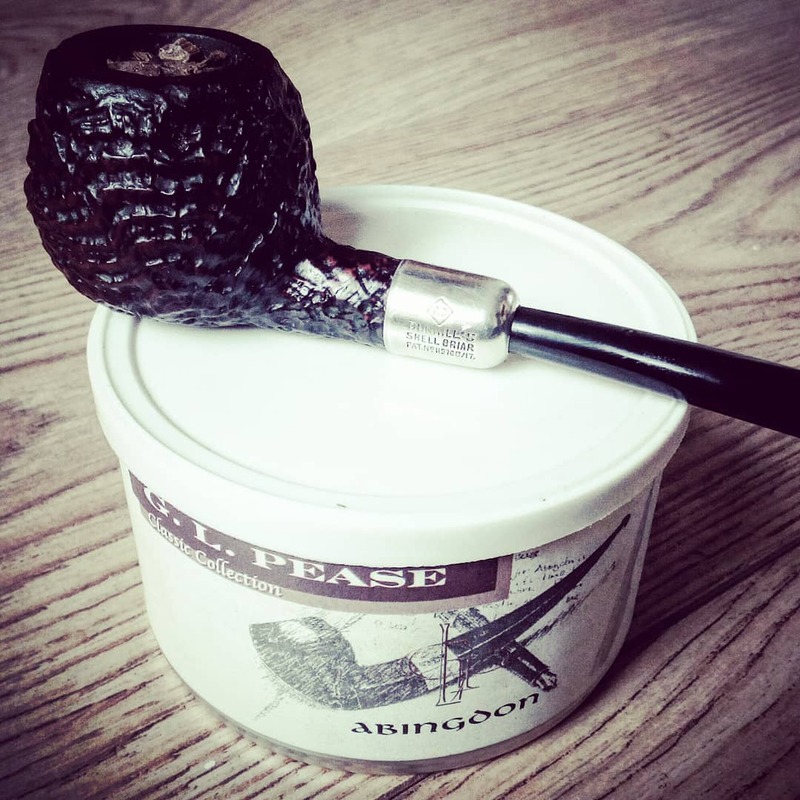 In the last bit of the bowl the flavours slowly starting to fade out similar to that of the fading sound a great musical piece and in the end a fine grey ash is left. 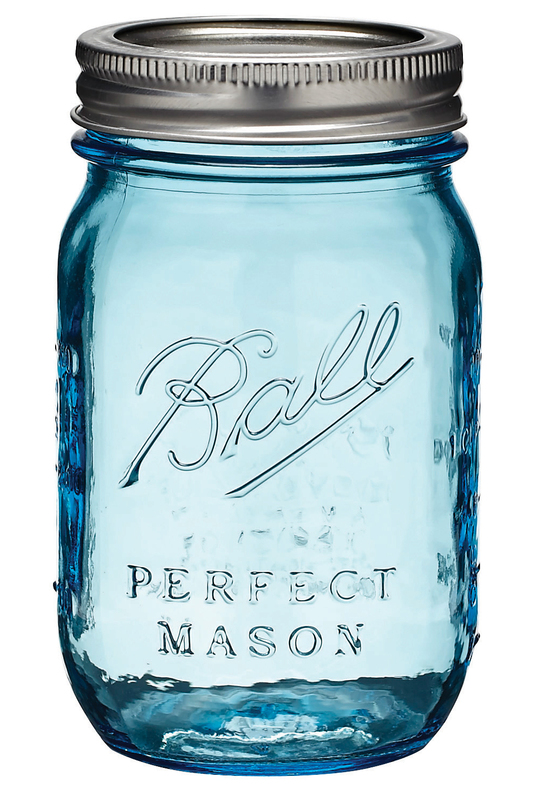 Combustibility: Once lit the mixture keeps burning pretty easy with few relights. No comments here. Room-note: I don’t see my girlfriend Ellen hurrying out of the chamber or coughing violently while I smoke Olaf’s so I guess the room-note is acceptable for a latakia blend. She has smelled worse. Miscellaneous: Olaf’s benefits from a longer shelving time so the flavours have more opportunity to meld together. Pretty necessary for a complex blend like this one. 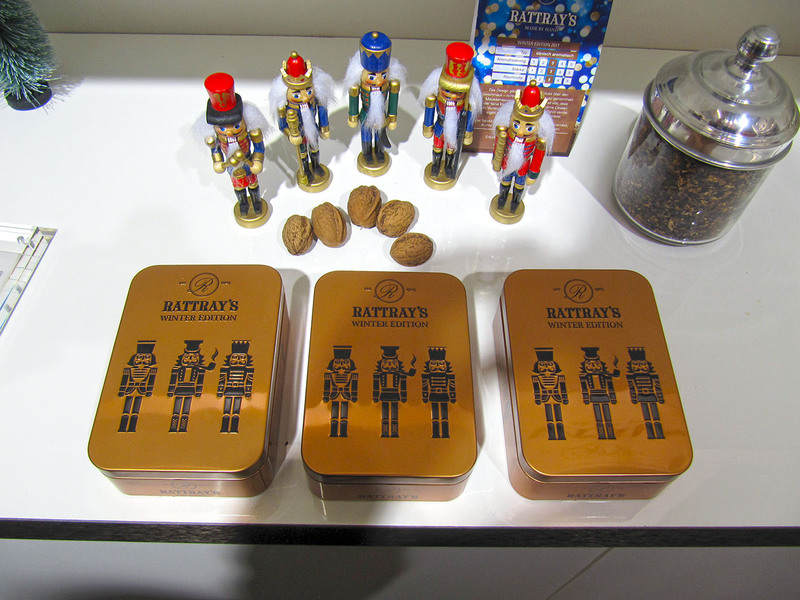 When I opened my tin it was tinned one year before and I found it good for consumption. 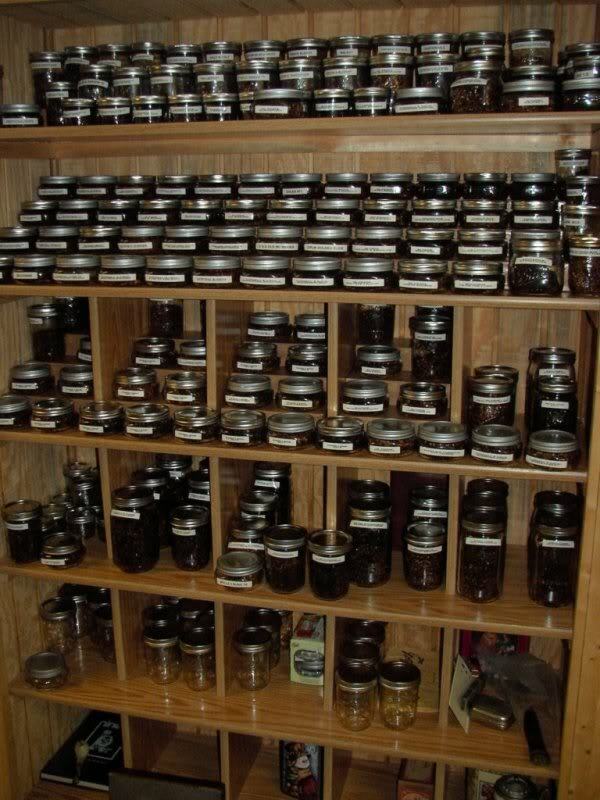 However, I am very curious how the mixture will taste after a couple of years of peace in my tobacco closet. The nicotine level is medium, it really is a late night smoke in that regard. Maybe it fits together well with a glass of fine whisky or red wine. 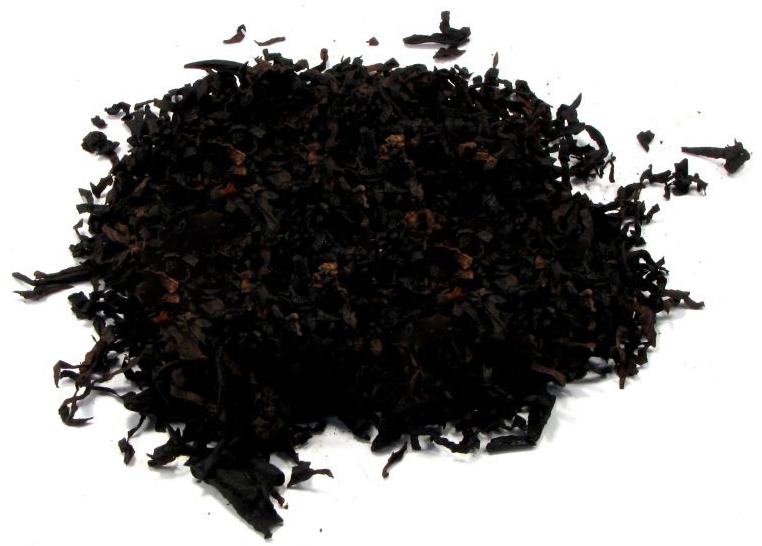 Also because of the complex character of the blend I would not advise to smoke it in the morning. One thing that sometimes bothers me a bit about Olaf’s is that now and then it has the tendency to bite in the first part of the bowl. From the other side it could have something to do with my body chemistry on some days. 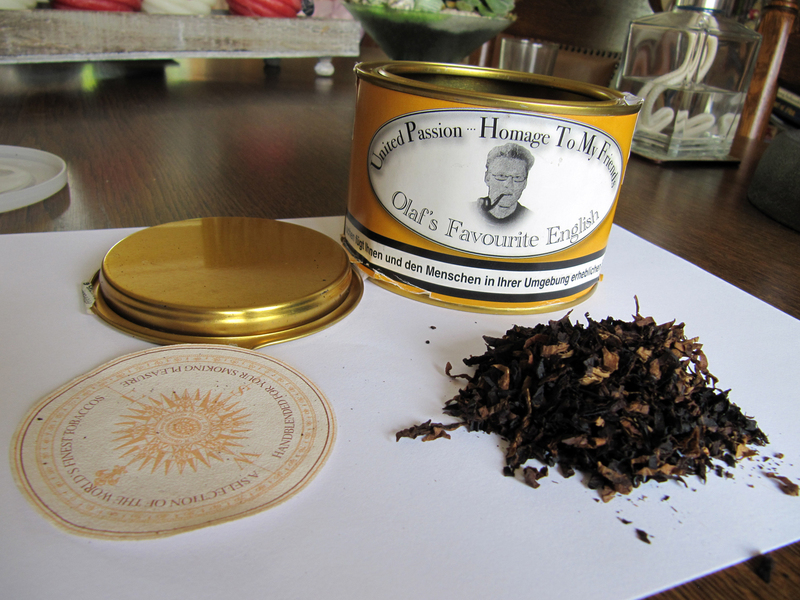 Price: My tin was a bit cheaper but thanks to German tobacco-taxes one 100 gram tin of this wonderful mixture will now cost you €18,35 ($24.21) in Hans’ online shop. 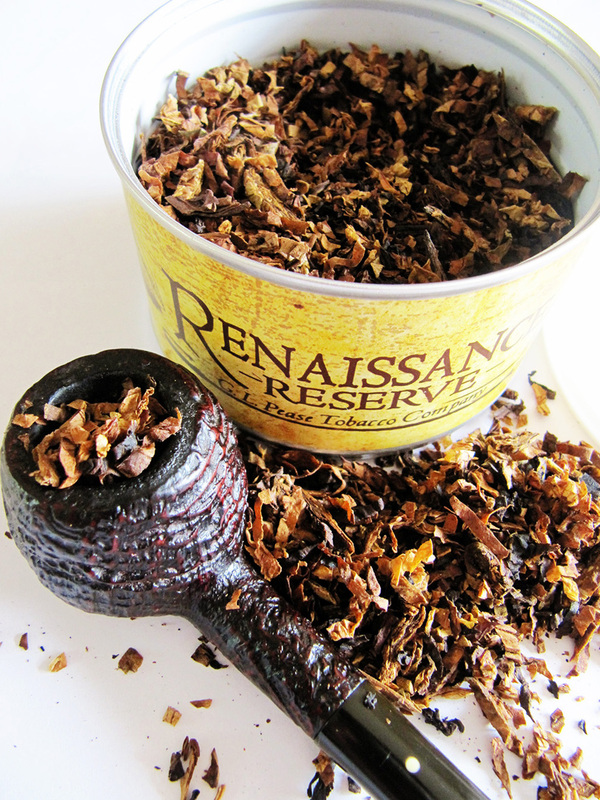 Conclusion: From the first puffs I took from this excellent blend I fell in love with it. For me Olaf’s Favourite English delivers everything I expect from a wonderful English mixture; it is complex but without bragging about it. 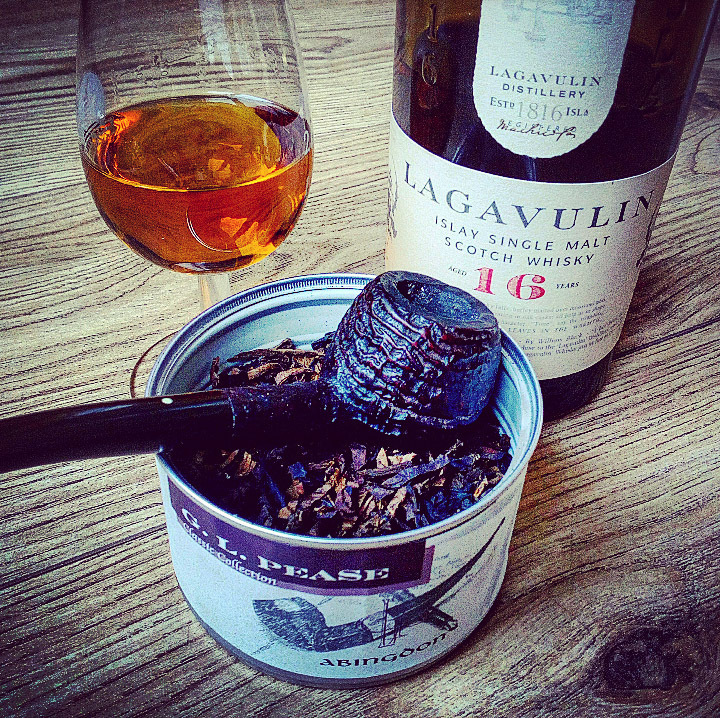 All the flavours from sweet to smoky to leathery to sour to salty weave throughout the smoke in perfect balance. 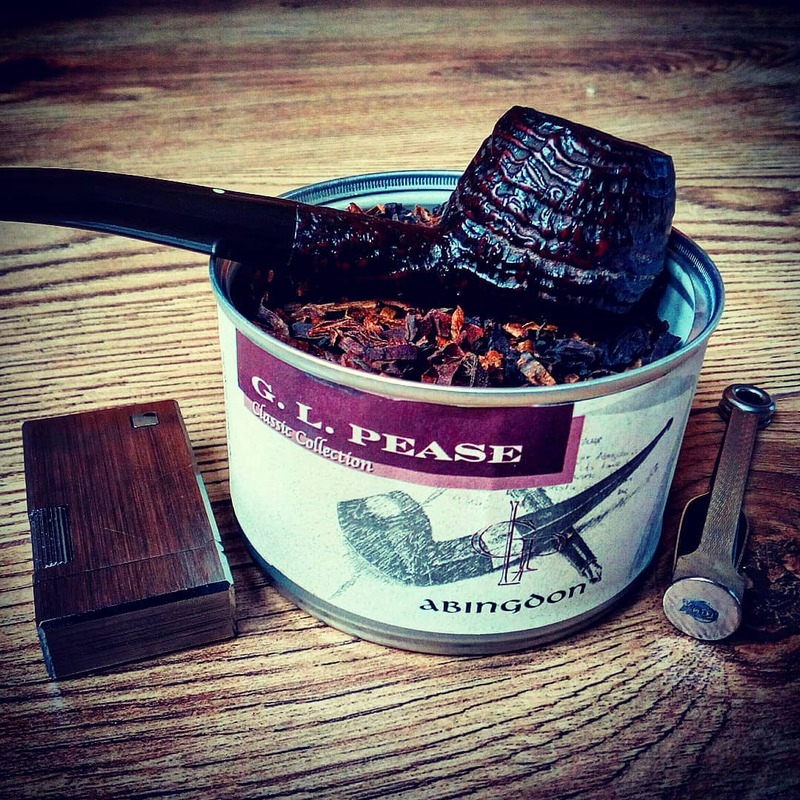 Personally I think this is one of the best latakia blends on the mainland of Europe and it can easily compete with the finest offerings from blenders like GL Pease.